I like my Burris Fast Fire III on my Glock 20. It is a very nice electronic dot sight. In my opinion, however, there are three specific issues that most, or really all, red dot sights suffer from. First, they require power, which means a battery. Batteries run down and I have also seen that, fairly often, the battery seems to be prone to part company the sight under recoil. 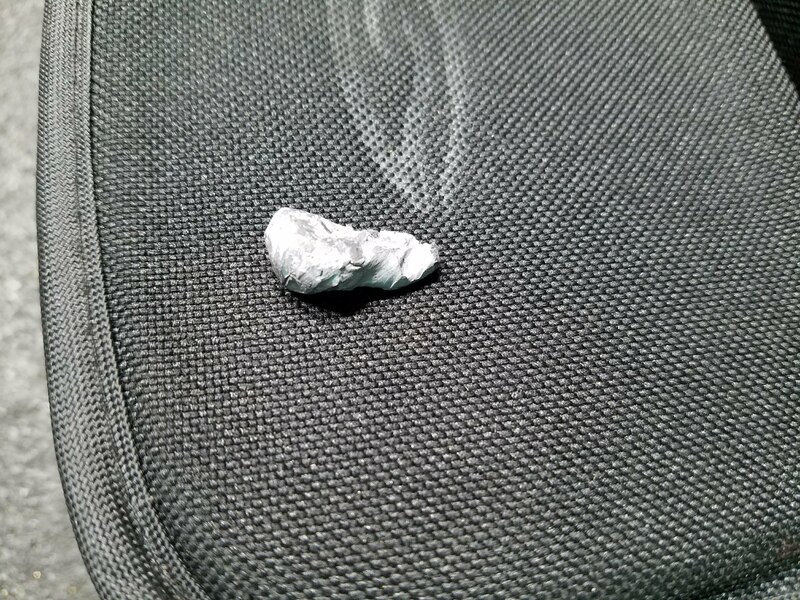 I have recovered the cover and battery from my Burris and just last night, a shooter in a local IDPA match lost his, maybe 5-6 shots into the last stage of the night. I am certain there is some degree of user error involved; there certainly was with mine. Design plays a role, driven by the need for a battery to be there at all as well as needing to be replaceable. Tied closely to needing a battery is needing a power switch. You have to turn it on to use it and remember to turn it off when you’re done, or it needs to have added complexity to try to do this for you automatically. If the system uses some sort of sensor, then even when “off”, the unit likely draws some miniscule amount of power from the battery. Finally, they tend to be kinda clunky, even the sleek ones. Even if a pistol is designed for one, function follows form and they necessarily need to sit on the top of the pistol like a frog on a log. Even if you like this look, and I kinda do, the extension of this issue is that the visual axis is farther offset from the bore axis than with plain ol’ open sights on the same pistol and even more so if the pistol was not specifically designed or modified to have such a sight installed. Since it really isn’t the sight’s fault, the Honorable Mention green ribbon goes to the double edged sword issue of the user’s own eyesight. If, like me, you are fairly profoundly nearsighted, one of the common prescriptions for corrective lenses is to split the corrective powers so that each eye can specialize on near or distant vision. 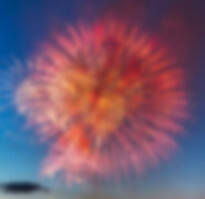 Typically, your dominant eye is elected to see nearby where details are important and the dot, which is optically at infinity, is thus rendered as a blur. In my particular case, it is not only a blur that also appears larger than the entire target, but it’s also not even a nice regular blurry spot but a jagged starburst. It looks as much like fireworks as anything else. 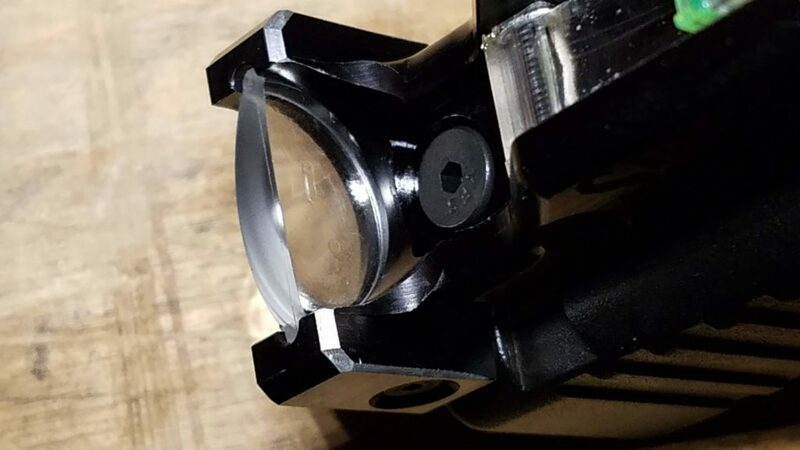 Ironically, this prescription arrangement works well for open sights because the all-critical front sight is in focus and the non-dominant eye can see downrange. This is at least an addressable issue for me and IDPA/USPSA competition because I can just swap contact lenses and thus roles, letting my dominant eye see in the distance where the dot is. 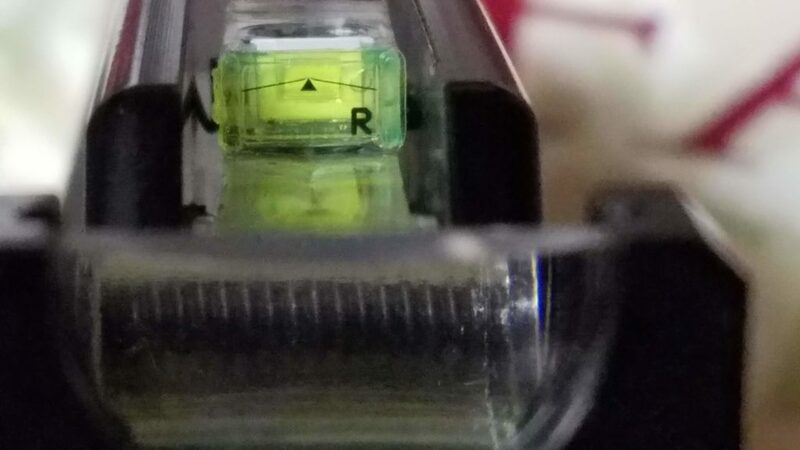 I have the same sort of issue with my Vortex rifle sights and really pretty much any optical sight, camera viewfinder, etc, though the illuminated dot is the worst. The SeeAll sights eliminate the power and/or switching requirements. The compact design also helps with the offset between the visual and bore axes. It does nothing specifically for my nearsighted visual issues, but the problem arguably less severe since the reticle not a tiny illuminated point. The sight works very simply, really more of an optical interpretation of open sights. Align the reticle with the target just like putting the front sight and rear notch or the red dot on the target and shoot. When I decided to get one, it was right after SeeAll started a Facebook advertising blitz. I don’t know if that was the cause, but when I wanted to order, the pistol models were all backordered. The $99 standard version was backordered two months until March 1st and the $199 tritium backlight version was only backordered only one month, until February 1st. Even though I will use this primarily for competition and essentially always in reasonably good lighting, I was kinda forced to buy the the more expensive version in order to have it in hand sooner. I chose the triangle reticle assuming that would be easier for my compromised vision to find. They also make it with a crosshair reticle. True to their word, is was shipped promptly when expected, actually a couple of days earlier. It arrived in simple but well made packaging and I had it installed in minutes. It works very simply. There is a tiny printed reticle on the top of the sight and a lens at the back that magnifies the image of the reticle. You can also just see the tritium tube inside the white cutout area behind the triangle. In my personal opinion, the tritium light is not bright enough to be seen except in conditions that are dark enough that you probably can’t see what you are aiming at. To me, the difference is not worth really the doubled price. Your mileage and use case may vary. The next day, I took it to the range for for sighting in. For the first time *ever*, I had a new sight that needed no sighting in. It was dead on point of aim as it. I still have not touched it. I have an installation caveat that might just be something that would happen only to me. The night after the range trip, I was cleaning and oiling the pistol for a match the next day, the SeeAll’s first trip to a match. I noted that around the screw that attaches the sight to the dovetail, there was a film of liquid, presumed to be oil. It’s tight in there, so I elected to just use air to blow it out. After that, I noticed that the oil was all over the lens and thought, “Ah, next time dig out a swab.” and cleaned the lens. Well, attempted to clean the lens. Turns out that the fluid was green Loctite that had not set in OVER 24 HOURS. It set wonderfully once it was all over the lens. It was a mess, like looking through a dirty windshield. After much hand wringing, I found that denatured alcohol cleaned it well enough to return it to functional status. In use, I find the SeeAll to be at least as fast to acquire as a red dot and easy to shoot. In the first match out with it, I shot reasonably well and where I didn’t, it wasn’t the sight’s fault. As it was an outdoor match, the green and black reticle was brilliantly visible. 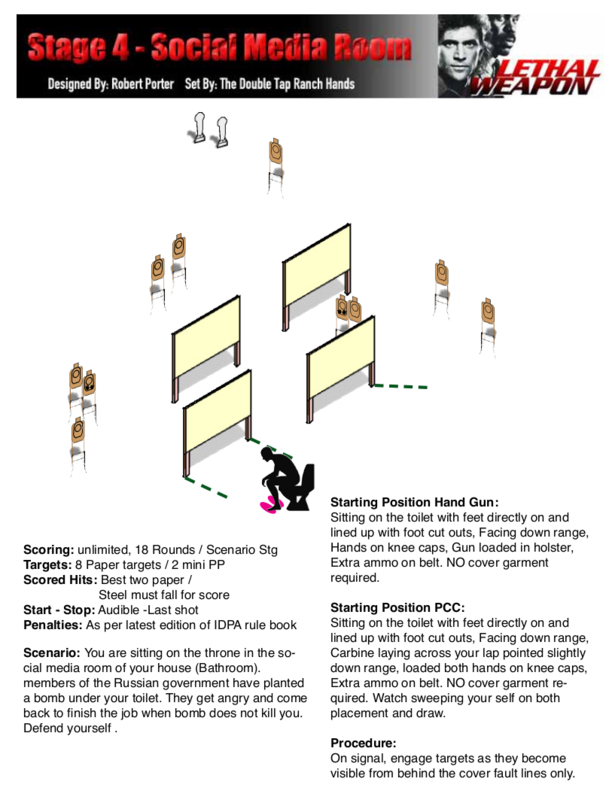 In the first indoor local IDPA match I used it, I was only 3 down in 4 stages. I was perhaps not as fast as I may have been otherwise, but I’m not really super fast. Not yet anyway. There were a couple of slightly dimmer areas in the indoor range that made it slightly little more difficult to locate the reticle. Active lighting is not all bad. The one major detraction is that it has some sharp edges on it. 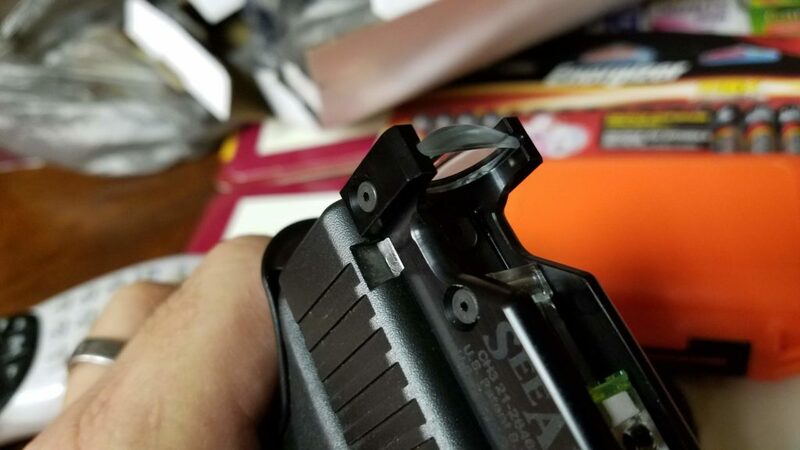 This edge, really a corner, is placed so that you are likely to scrape across it while operating the slide, especially in a rapid manner such as clearing a malfunction. It was harsh on the range trip to sight it in and it drew blood the first time out for a (non-IDPA) match. I went directly to the workshop when I got home and filed the most dangerous edges down. This is somewhat better, though in the aforementioned IDPA match with it, this softer edge caused a blood blister in the same as-yet-not-fully-healed spot where the previous outing had cut my thumb. In a match last night, I kept all my blood and skin. Once the initial injury fully healed and after filing the edges, it may not be a big deal. I note also that some of the SeeAll sights are not made exactly like this one. They may yet be experimenting with details and for the short term, the edge might be a side effect of another improvement. So, is it a really cheap optical sight, in the same vein as a Burris or Vortex red dot, or is it just a funky new design for open sights? Should that matter? It was fun to studiously avoid the advice of a helpful SO who reminded me to be sure the optic was switched on for the first stage. 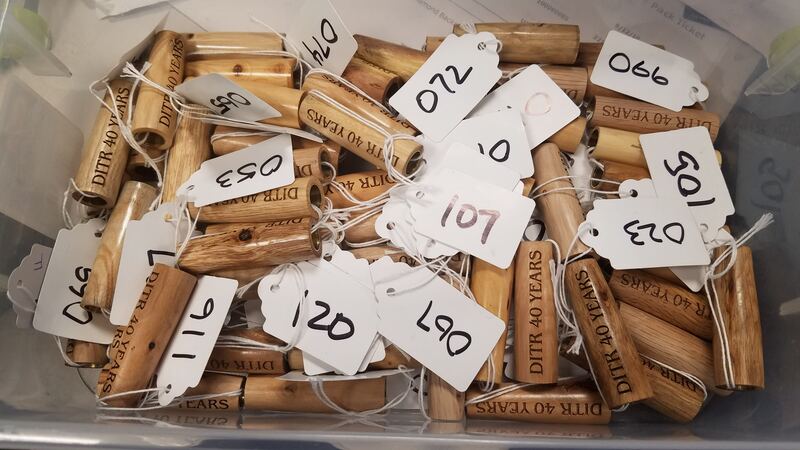 In any case, the proof may lay in how I classify with it at an upcoming classifier match in a couple of weeks and again how I place in a special IDPA Tier 3 CO/PCC match my club is hosting in June 2019. I will measure the offset between open sights, SeeAll and Burris at some point, probably utilizing another slide I have because I don’t want to remove the SeeAll to do so. In the post about making a lot of pens, I mentioned that making the custom drawstring bags for those pens deserved its own post. I started by deconstructing a commercially available velvet pen bag to develop a pattern. 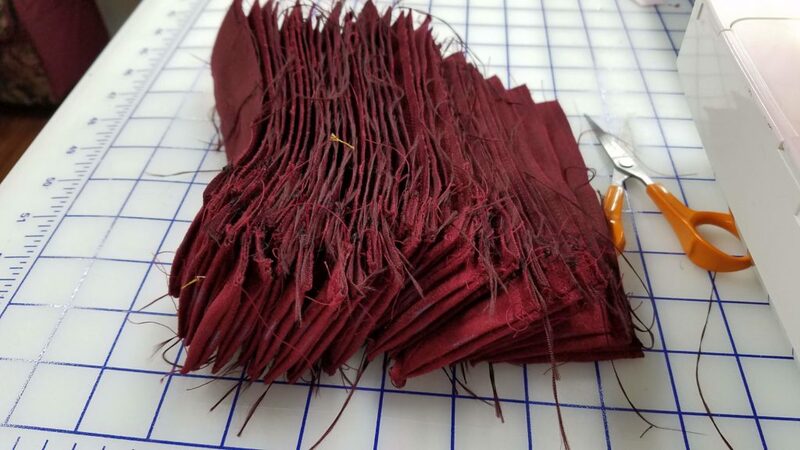 These are pretty simple bags, made from a single piece of fabric about 3 x 7 inches, with strategically placed slits cut into one edge. 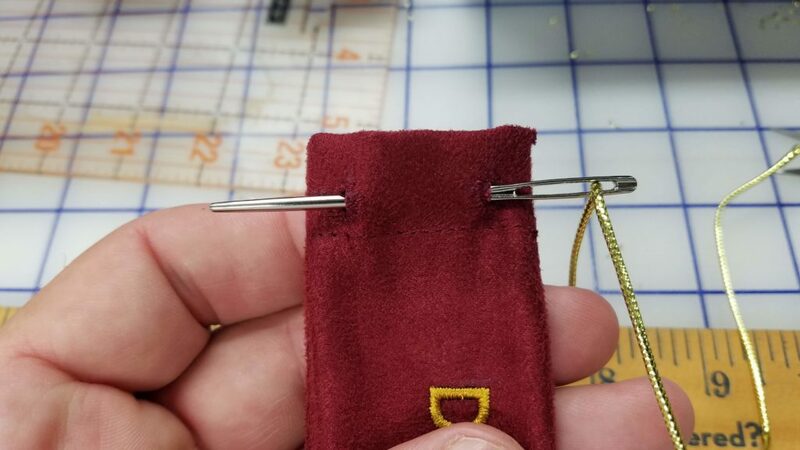 The top edge is turned and stitched down, leaving a tube for the drawstrings, and then the fabric is folded right sides together and stitched down one side and across the bottom. The resulting bag is turned right side out, the drawstrings threaded in through the slits and tied, and you have a bag. 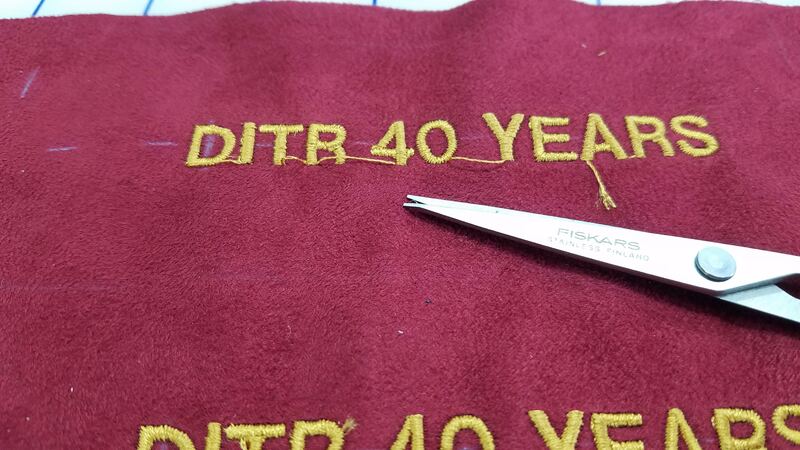 We decided on an arguably easier way for us to stitch them, though it did require stitching both sides. We made a couple of prototypes to nail down the dimensions. 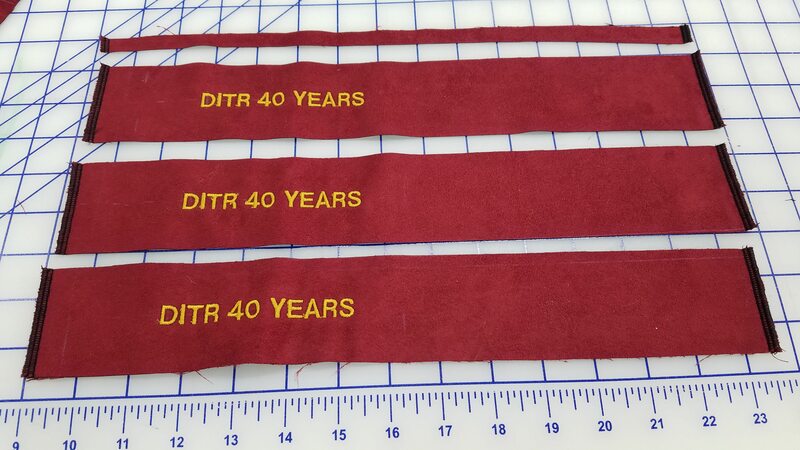 The final dimensions to cut for one bag was 2-1/4 x 15 inches. 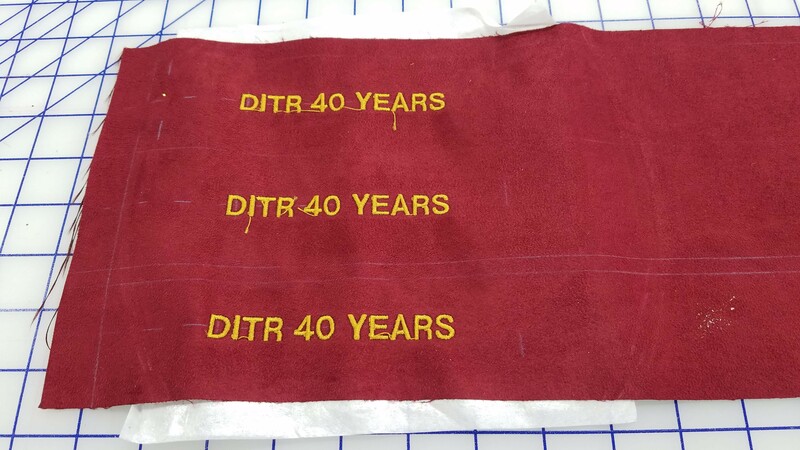 I determined where to mark the fabric to simplify embroidering the logo onto the fabric, it was best to hoop one 6-3/4 x 15 panel, enough fabric for 3 bags. 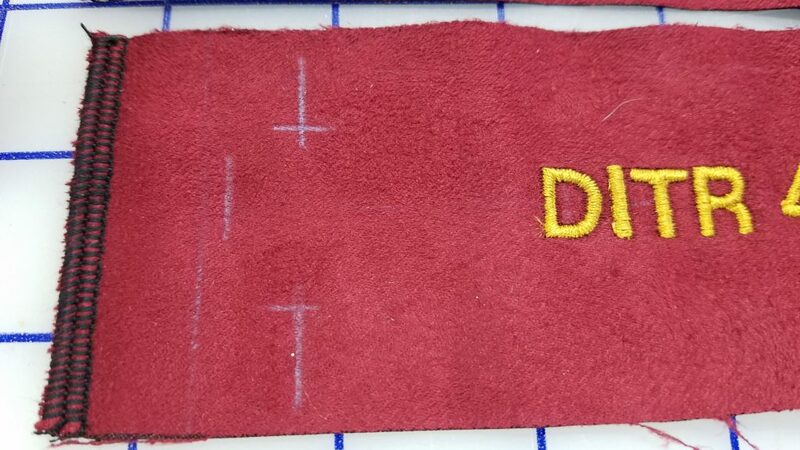 I f you look closely, you can see my fabric marker lines. The solid lines are the 2-1/4″ marks to line up for later cutting the strips apart. 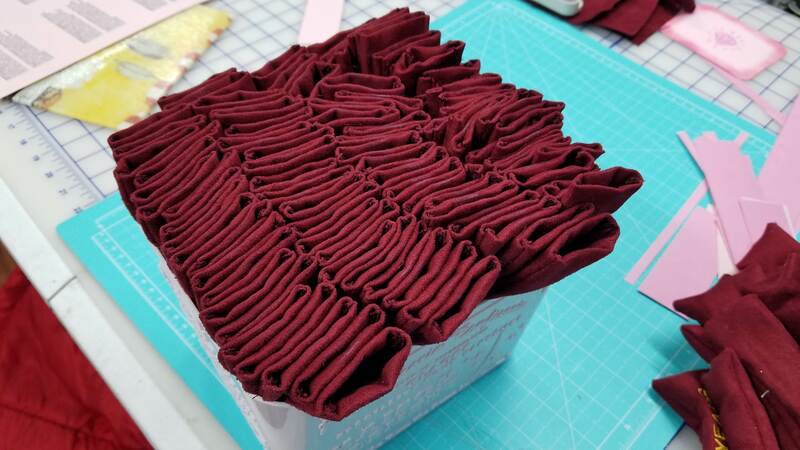 There is a center fold line at 7-1/2″, which I never actually used for folding. 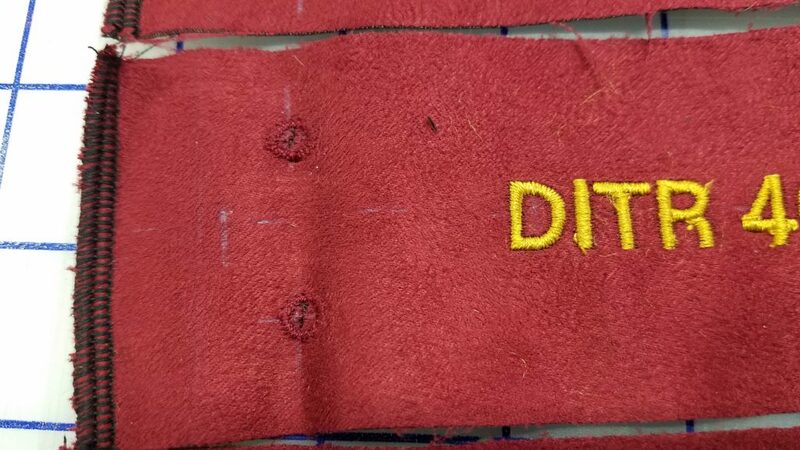 The dashed line is the center of the strip and together with a crossing line 5″ from the center, was used to line up the embroidery. After removing the stabilizer, trimming the threads, and serge stitching the short edges, the panel is ready to cut into strips. I fine tuned the dimensions so that I didn’t have any waste strips like this one had. Now comes marking the ends. Experimentally, I arrived at dimensions that were just easier to measure off with a metric scale. At 20mm from the end is the fold line. 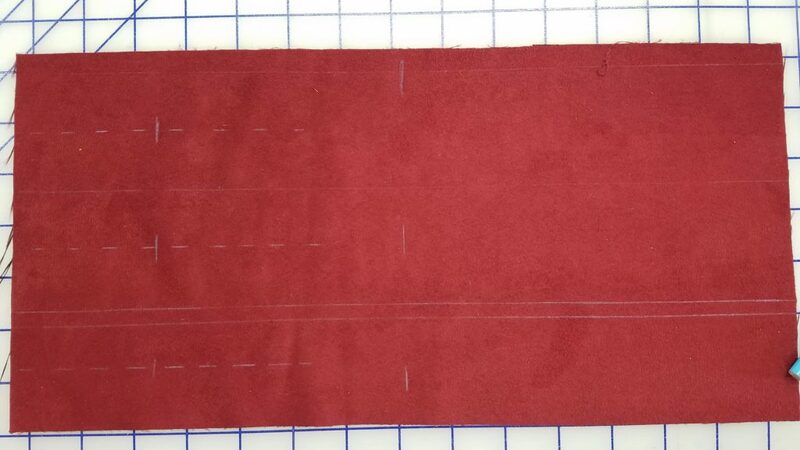 30mm from the end and 15mm from each side are intersecting lines that mark where an eyelet will be sewn and cut. I then folded the two ends wrong sides together using the 20mm fold lines and stitched it along the serging. Finally, I folded the whole thing right sides together and stitched the two long sides. I trimmed the fray, and any sewing thread ends, and turned the bags right side out. 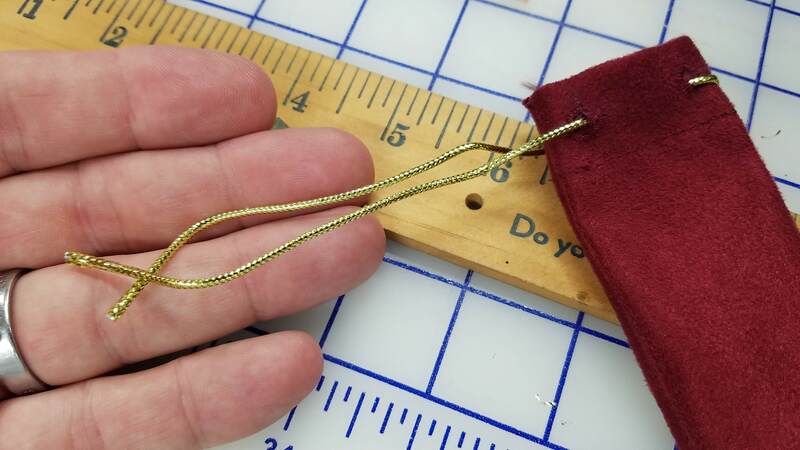 Lastly, I threaded the drawstrings through the eyelets, one from each side of the bag. The finished bags look pretty good, if I say so myself. Logistically, I cut all the fabric I had and was a little short for 120 bags. 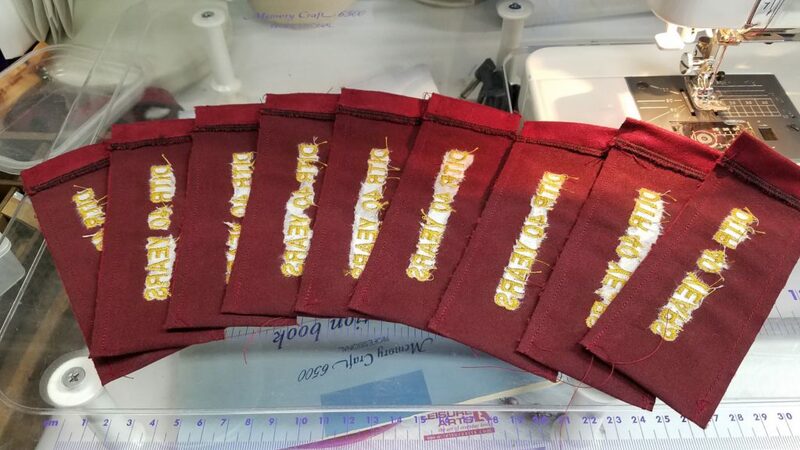 Since it took 6 minutes for the embroidery machine to do each logo, I used that time to do all the other steps as far as I could until time to change the panel out for another in the machine. I thus stayed busy very nearly 100% of the time while I was in the sewing room and I made pretty good time. At first I had a dozen completed bags, then I had various other numbers of pieces in varying stages of completion. I would inventory as I finished each night. For the last dozen, once I had more fabric in hand, I made them in much the same way. 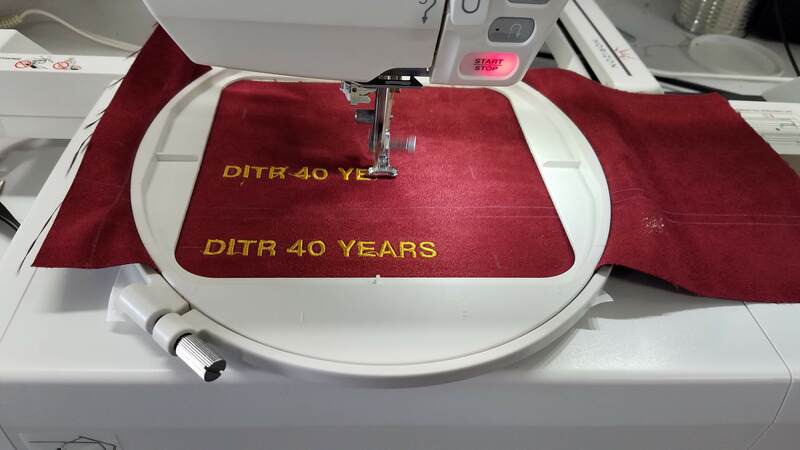 I couldn’t get quite as far ahead of the embroidery machine, though. 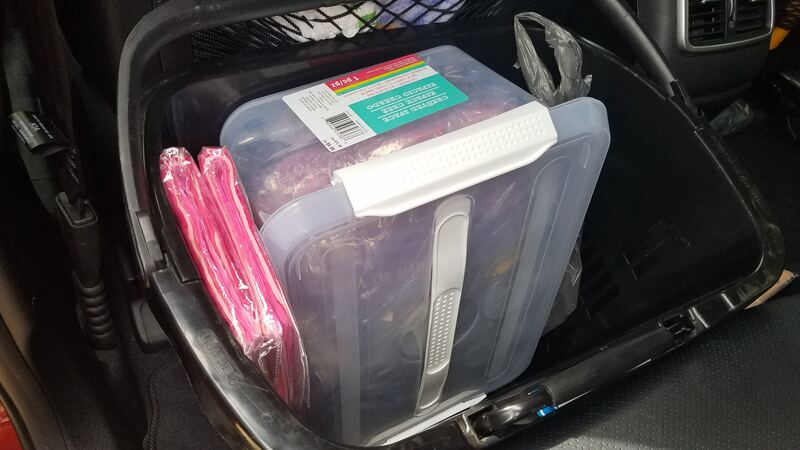 On the morning of delivery, I had a few bags left that still needed drawstrings, but Toni and the LGA crew finished those few as they distributed the pens into the swag bags with the rest of the goodies. Here they are in the car, about to head to the club. I was happy to see them go! 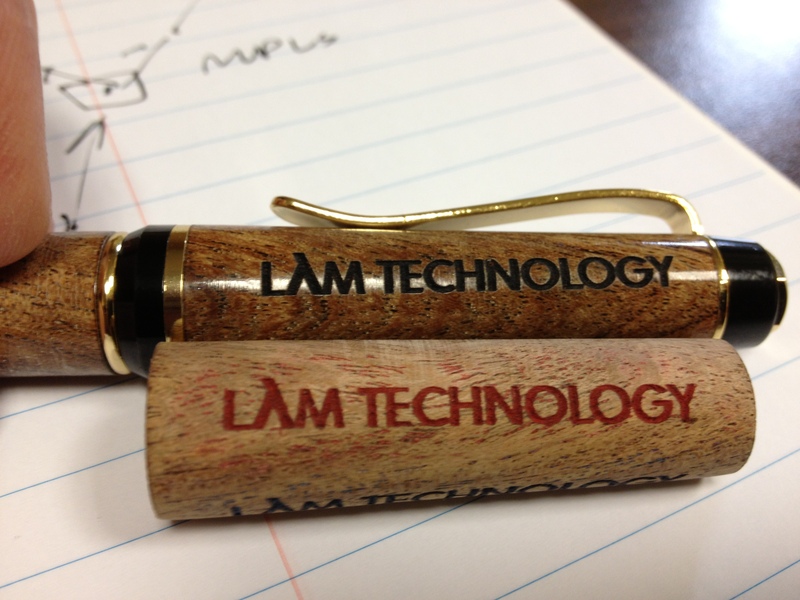 Photo metainfo indicates that we first started turning pens in November of 2012. I can only estimate that in the intervening 6 years, I have made somewhere around 200 pens. Well, until a recent order which adds 50% to that figure. My wife is a golfer and her club has an annual charity golf tournament. This year is the 40th anniversary of said tournament, so they were looking for special items to include in the swag bags for 100 players. 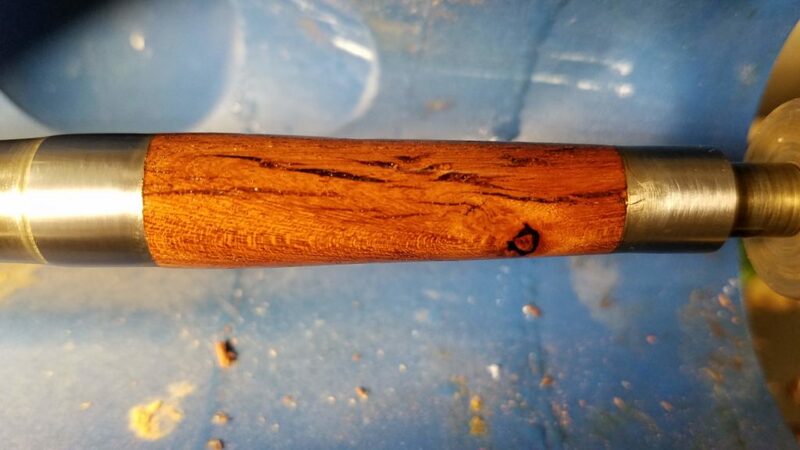 Pens were a natural for us to suggest and to make it more special, we made them from wood from the golf course, mostly fallen branches. Turns out that, within some limitations, the more diseased and damaged the branch is, the more interesting and beautiful the pen is. 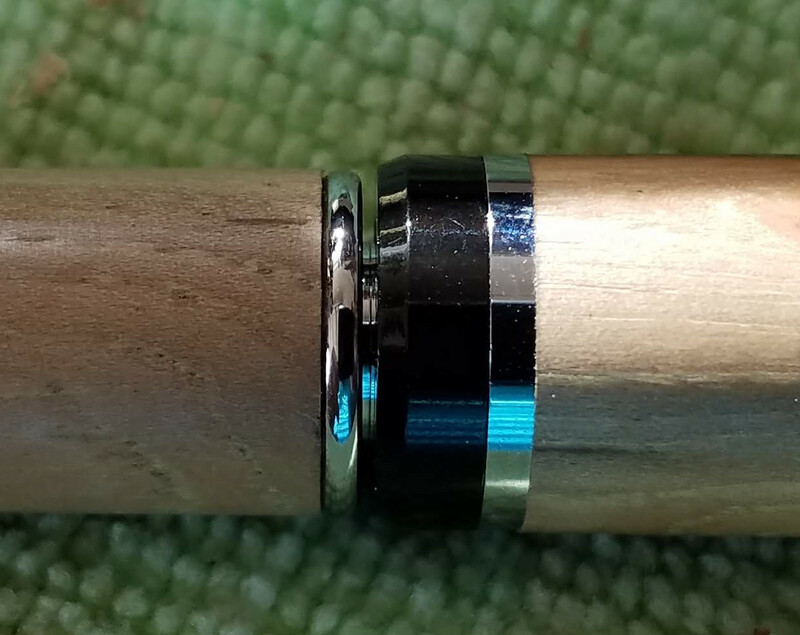 Most of the time, I make pens one at a time or on rare occasions, I may suspend work on a pen for a bit while I make another, usually for rush orders or other such logistical reasons. I made an order of 10 pens once. They were all turned from mesquite and they all had a company logo engraved on the cap. They each went back to the engraver later to have individual names engraved. I kept the units separated in a divided container and matched the parts up visually when the caps came back from from the logo engraving. I used a Sharpie brand permanent marker 🙂 to number bags 001 through 100; likewise for string tags. I then ordered 100 Cigar pen kits from Craft Supplies USA. 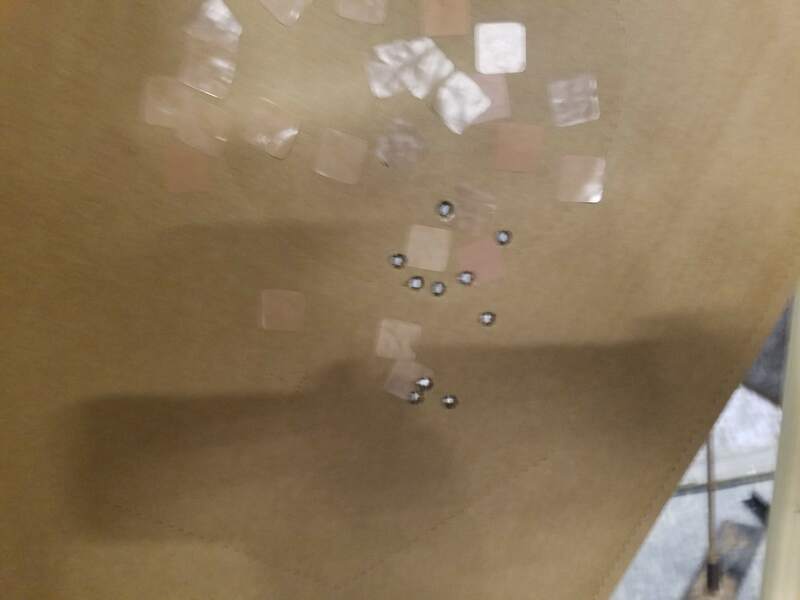 When they came in, I took the kits apart, putting the tubes in separate bags and putting the rest of the kit parts and the string tag in the numbered bags and finally putting the now numbered kits in a box. The wood selection was complicated. 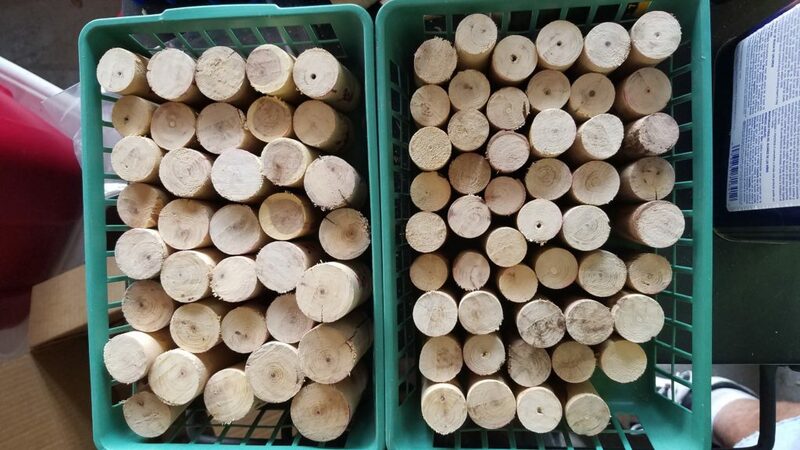 We had been gathering fallen branches at a low rate well before the pen order came to be, but accelerated once it was decided to use wood from the golf course for the pens. The golf course is populated with oak, sycamore and mesquite trees. For the most part, fallen branches have fallen because they were sick. Once I started cutting the branches into blanks, the rejection rate was pretty high. Some were obviously damaged by fungus. Some had insect damage that was not visible until you look really close. Whatever woodboring insect that enjoyed munching on these branches left a tightly packed fine sawdust behind. 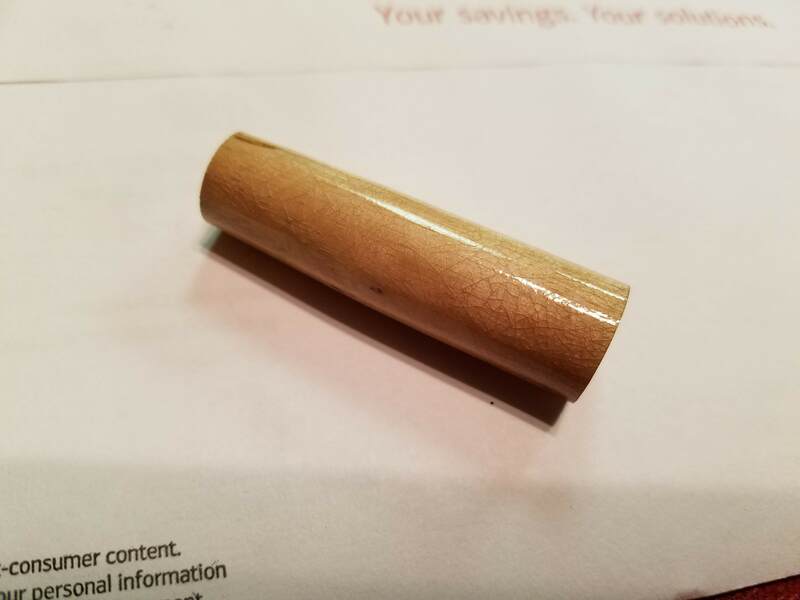 It’s so tightly packed and so much the same as the wood around it that it’s easy to miss, at least until it bites you a few times. Wormholes at in the periphery of the blank are not much trouble and if the bug moved largely across the grain, leaving holes in surface that could be filled easily. I did blank cutting in batches. I set up my bandsaw outside where sawdust could just be on the ground and cut until I was out of branches. I numbered the pieces as I went, just in numeric sequence. 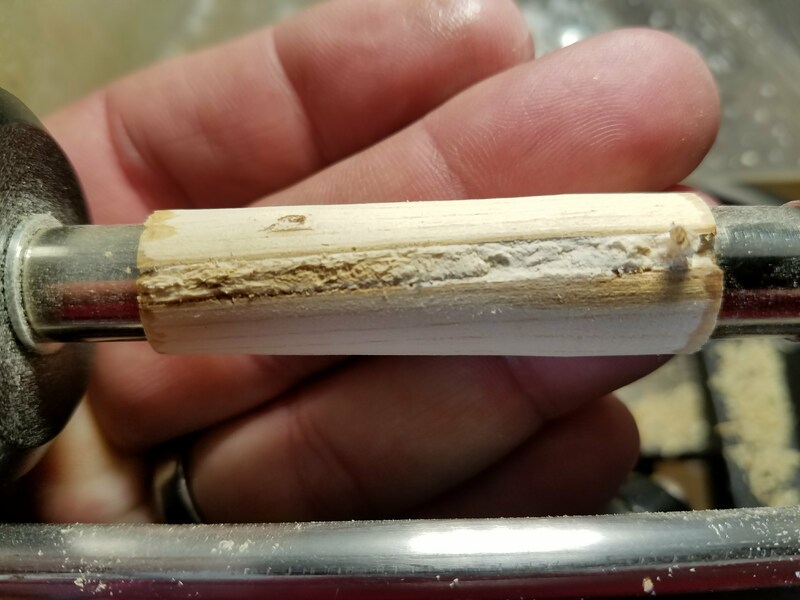 For the first half or so, I cut bark-on rough blanks into cap and nib end halves, marked with a jig tool I made. That proved to be imprecise enough to cause more problems than it fixed at first. 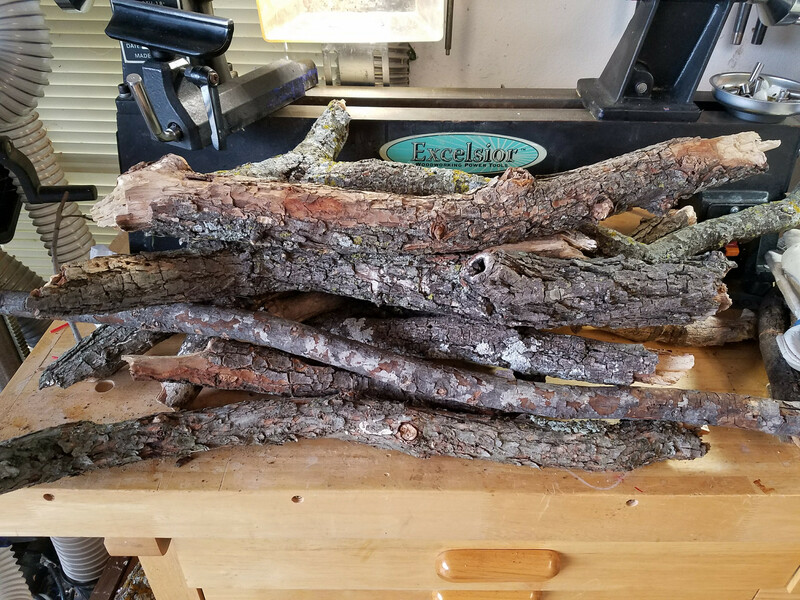 Finally, I learned to cut the branches into lengths similar to commercial blanks, using one as a template. I would inspect the end of the cut to see if the insect damage was likely to be a problem and discard if necessary. If it looked ok, those went in a stack of potential blanks. I set up a “spare” lathe outside as well after cleaning up a bushel of chips and dust off the workshop floor. Knocking the rough blanks down to round outside helped the workshop tremendously! Then the jig worked better marking the blanks for cutting to length. 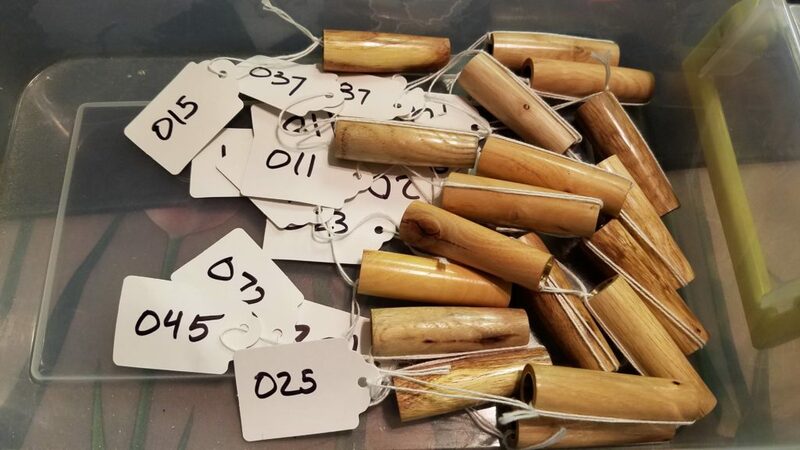 Somewhere in here, the organizers added 20 players to the roster, so I had to order some more pen kits and number some more bags and tags for a total of 120. 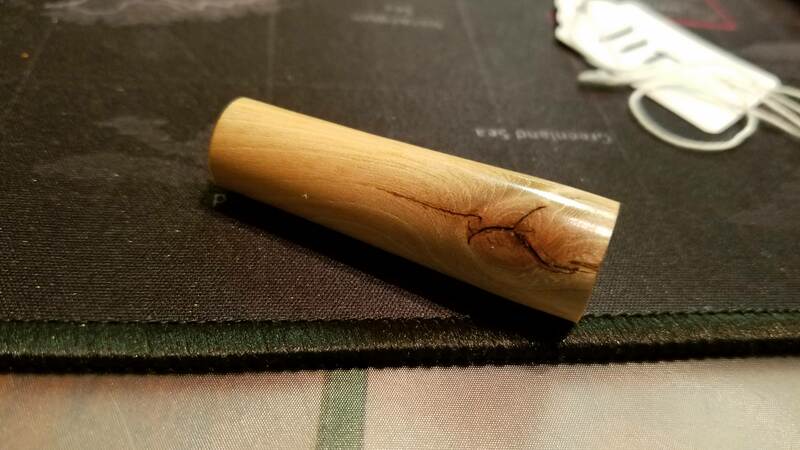 Fairly early in the process, I realized that I was spending about 10 minutes turning a pen and anywhere from 30 minutes to an hour with the filling and finishing process using CA. I prefer a CA finish, but it was killing my production numbers, especially as I had more pens to finish. I picked up some Doctor’s Woodshop Pens Plus finish. This is a walnut oil and shellac based friction finish that is probably 90% as glossy as CA, presuming the surface is nicely prepped before application. Most importantly, it usually takes about 5 minutes to apply and polish. 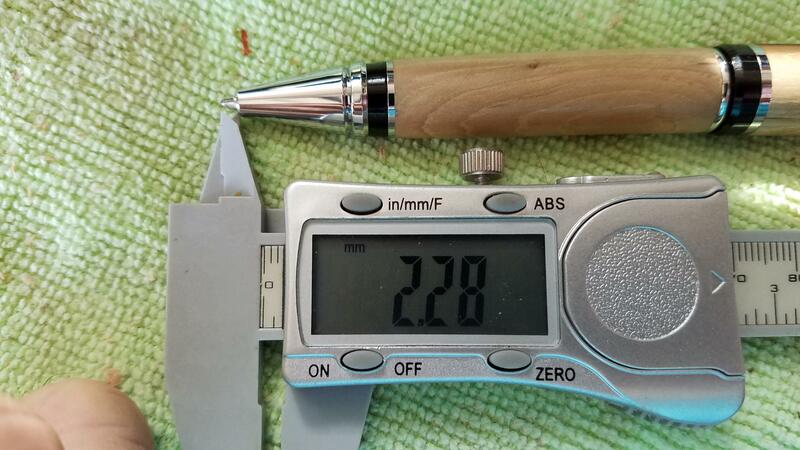 I don’t have any really long term wear info yet, but the test pen I made has held up to use and transport without issue. Surface prep before applying Pens Plus sometimes was just filling holes and sometimes even sealing / stabilizing spongy wood with thin CA. The Pens Plus finish works over the CA just fine. That does not work the other way round. It takes some time, but CA applied over Pens Plus will crackle and flake. That is not really surprising, but I had to at least try it. Most of the wood was oak or sycamore. The oak tended to have more simple insect damage and the sycamore tended to have more staining from disease. Most of the pens turned out basically white or light honey colored with little bits of interesting contrast, like knotholes, cracks, or staining. Some pens feature all three. There was only a few pieces of mesquite. Some of those were very nice pieces but some were run through with cracks. I turned them down to within a few millimeters of the final dimension before filling the cracks with CA. 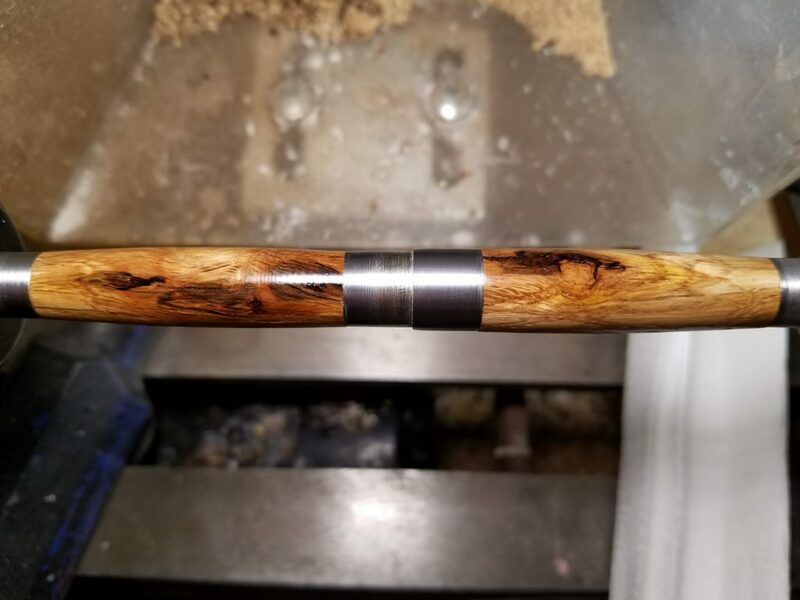 The final pen turned out very interesting. By the last half or so of the pens, I had a pretty decent process in place for spending a Saturday making blanks and a Sunday turning those, filling in the occasional weekday evening pen here and there. 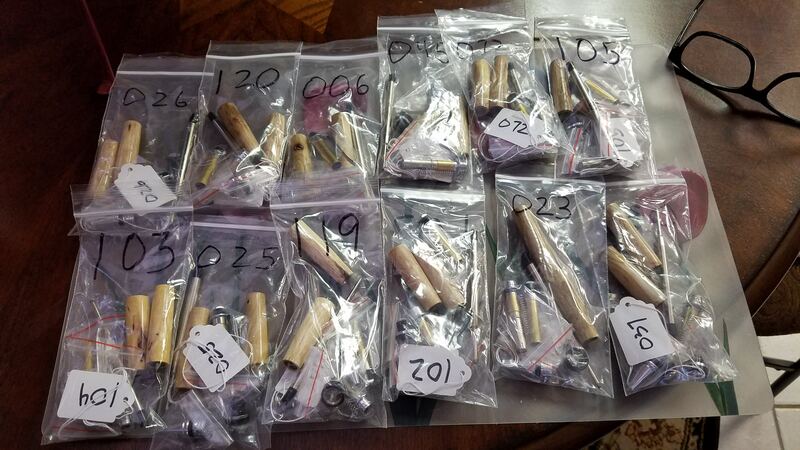 The numbers in the batches of blanks were mostly just to keep the pairs together and did not correlate to the kit numbers at all. When I ran out of one batch of blanks, the next would restart at 1 and sequence up until I ran out of material. 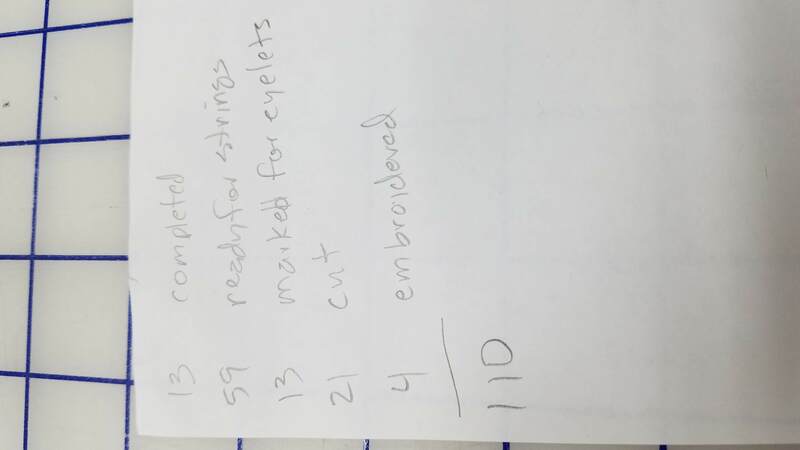 As I finished turning each set of barrels, they went into the next numbered kit bag that I pulled out of the box. They were just pulled out of the box without regard for the kit number; it didn’t matter at this point. 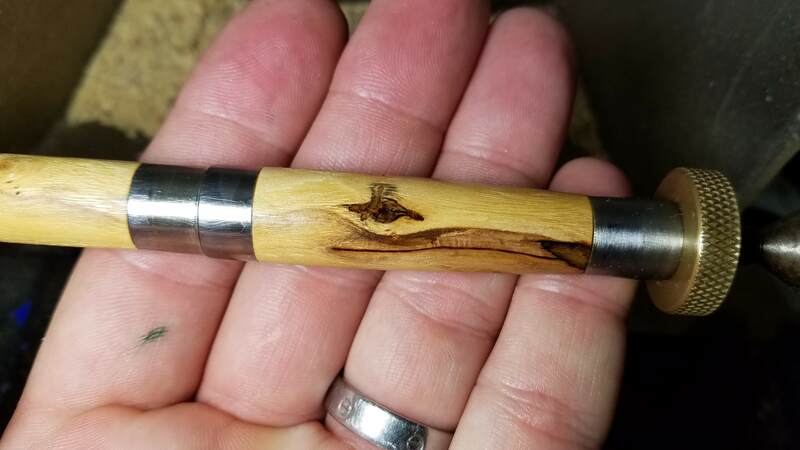 I delivered three batches of pen caps to the engraver to have the logo lasered on. I pulled the cap and the string tag out of the bag and ran the string through the barrel to secure it. The caps went in a plastic box and the kits with the nib end only went into their own box marked “out to engraver”. 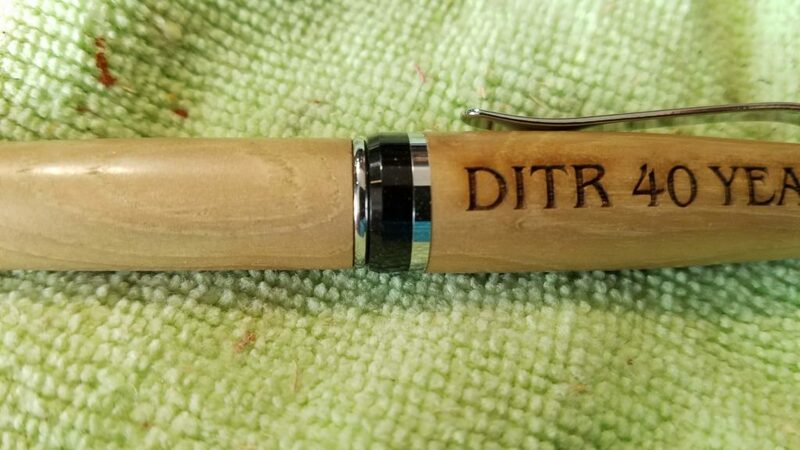 Having had quite a few pens engraved by this guy, he let me basically run it on credit so we could pay for all the engraving at once at the end of the whole job. That way the LGA could write one check. Your mileage may vary. When they came back from the engraver, I just had to pull out one bagged kit, find it’s mating cap in the box and do the final assembly of the pen. I put the string tag on the pen clip and put the assembled pen back in it’s numbered bag and finally into a box of completed pens. Things did not go perfectly, so I had to make a few extra pens to replace those that did not pass muster. I overzealously trimmed some barrels, which I will blame on lighting and not being able to see it was trimmed enough. 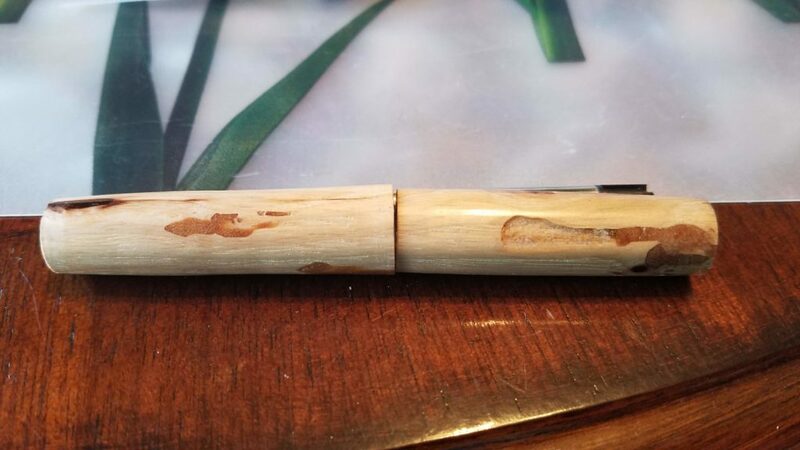 That resulted in a couple of pens with barrels that were too short, so the filler could not fully retract. One that was particularly sad was for a pen in which I had found the live insect when I was turning the pen. Well, most of it anyway. I had gone to special effort to fill the very large void so that I could have a pen with a specific story. I should note here that we picked two especially stunning pens to be our own from this project. I spent the time to apply CA finish and I paid cash separate for their engraving. Finally, it came down to the last weekend to completed all the pens. I had the last batch of caps from the engraver. I assembled them and found that all kits appeared to be accounted for. 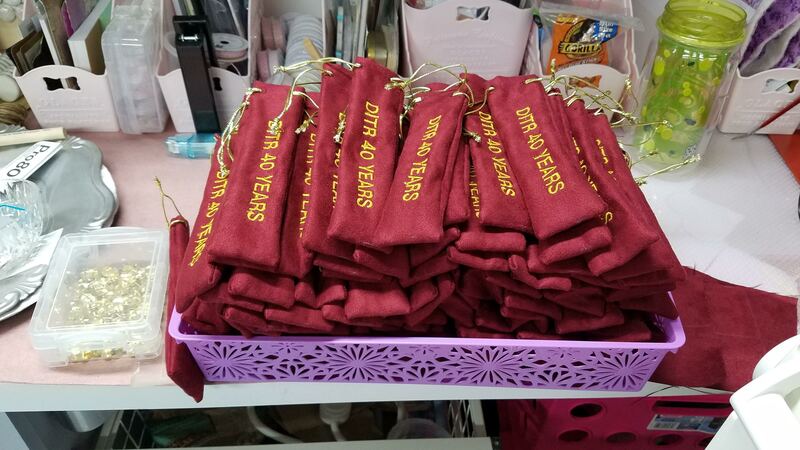 We had decided to make custom embroidered drawstring bags for these pens, which deserve a blog posting of their own. On a Saturday morning I was taking out each pen, taking a picture of it, removing the number tag and putting the pen in a drawstring bag; final packaging you might say. 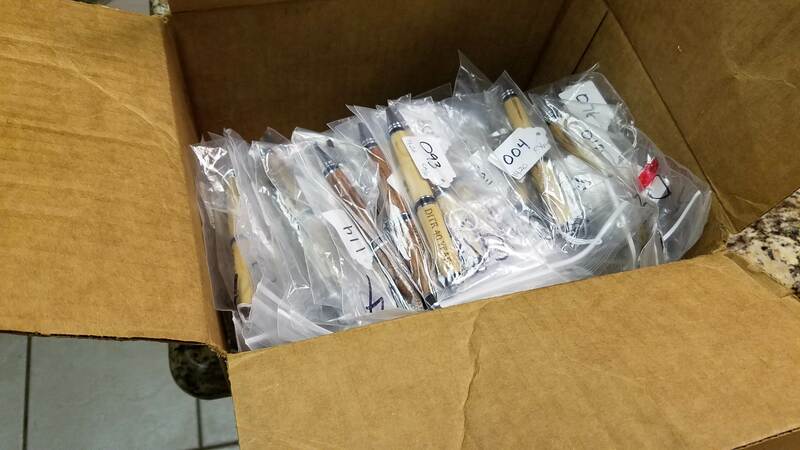 In the box of completed pens, there was one bag, #95, that had an unassembled and unengraved mesquite pen. I set it aside and continued the work. 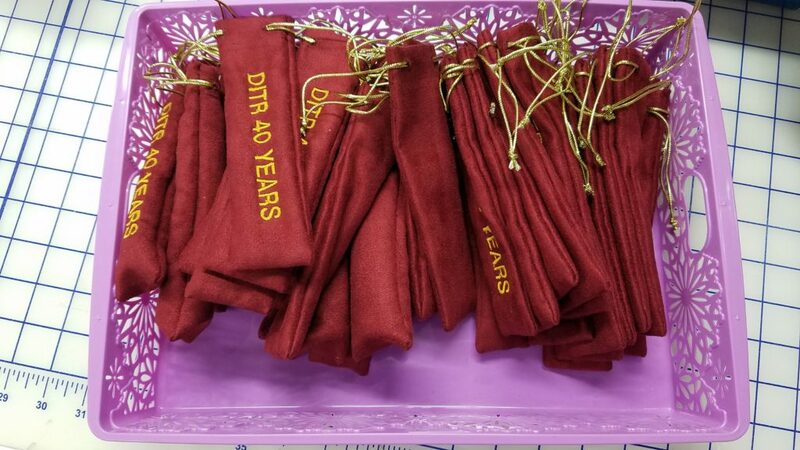 Due to some time constraints, a few of the bags did not have drawstrings yet and Toni was going to take them with her to finish them and the last few pens to back up. I counted up those plus the bagged ones and came up with exactly 120. Toni reported later that they were actually short by ONE pen. 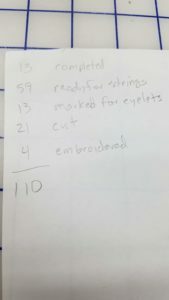 I presumed that I miscounted or added the counted numbers wrong. In any case, I had three options. Rush the pen #95 to the engraver on Monday, see if I could fix one of the pens with issues or surrender one of our special set-aside pens. I decided try fix the short pen. My first solution, while extremely elegant, was absolutely *NOT* the correct solution. Duh! The problem is that the barrel is too short already. Cutting the transmission shorter makes it WORSE. The much better solution is to trim the transmission plunger, effectively lengthening the space where the filler goes. I just used a drill bit, hand held. The cap was too short as well, though not by quite as much. I failed to photograph the solution, but the top of the transmission has a friction fit to an insert in the main tube of the cap. There is also a threaded fitting that the top nut threads onto to retain the pocket clip. The very top of the transmission was bumping the bottom of that fitting. I tried to remove that fitting with a hammer and punch, but I don’t think I had enough retention on the part and the fitting wouldn’t budge. 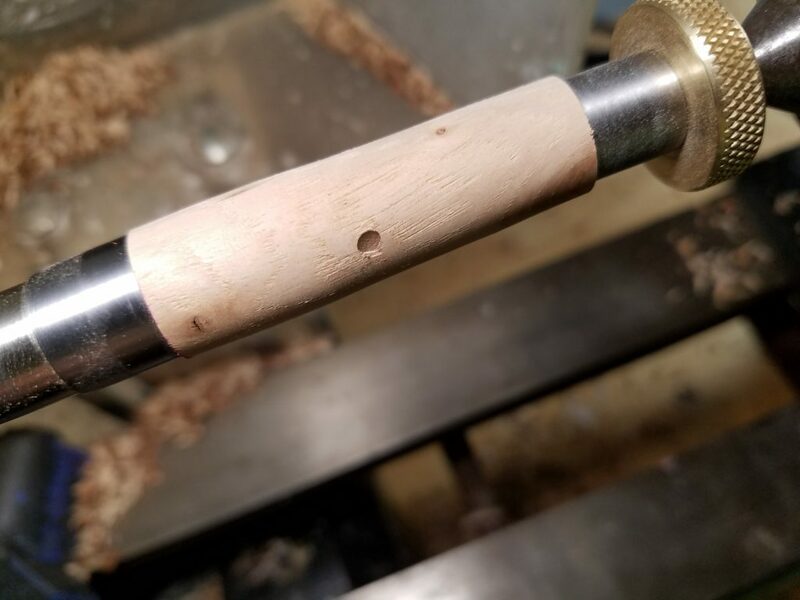 I made a (fairly poor) cutting tool to remove material from the fitting from inside the part. It took a bit of force to cut (abrade, really) the piece to clear the top of the transmission, but the mission was a success! 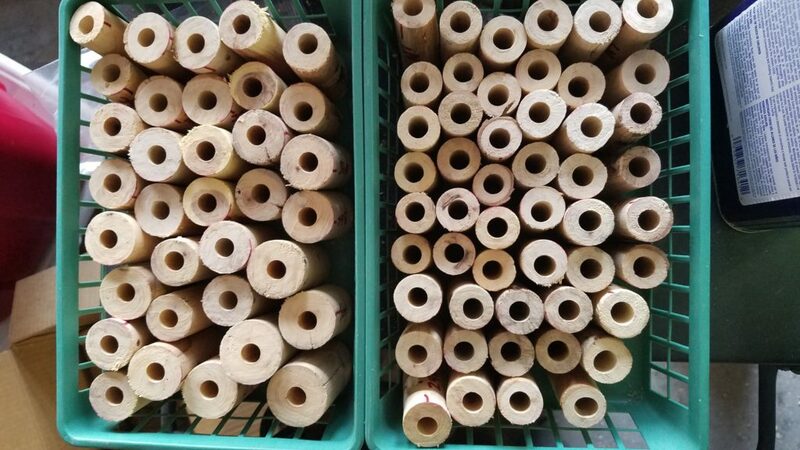 Friends who have followed this project (often without necessarily *wanting* to follow this project), after hearing of the various delays and issues with blanks and simply the number of units to make, have asked if I would ever do another large order. The answer is definitely yes. 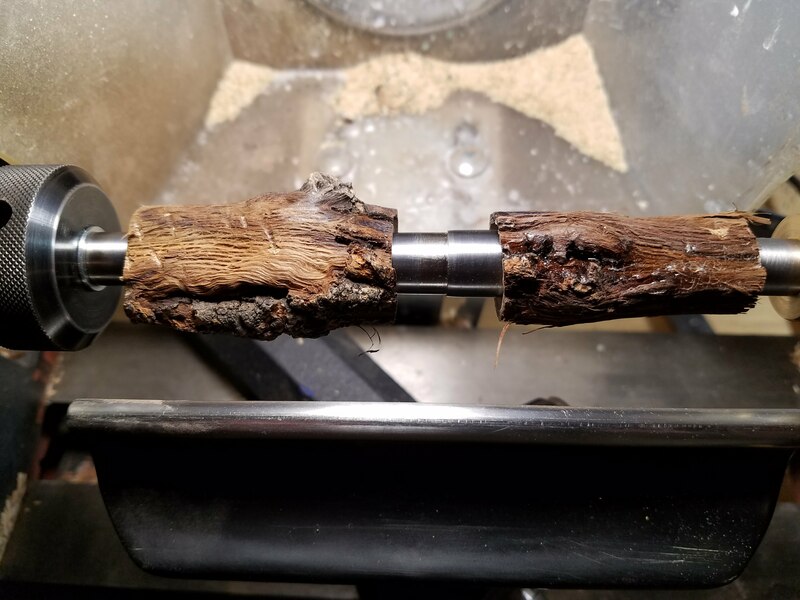 I might try to dissuade the use of salvaged tree branches, but I enjoyed the actual pen making and I am certainly willing to do more of that. I do not intentionally update this blog quarterly, but that does appear to be how it turns out! 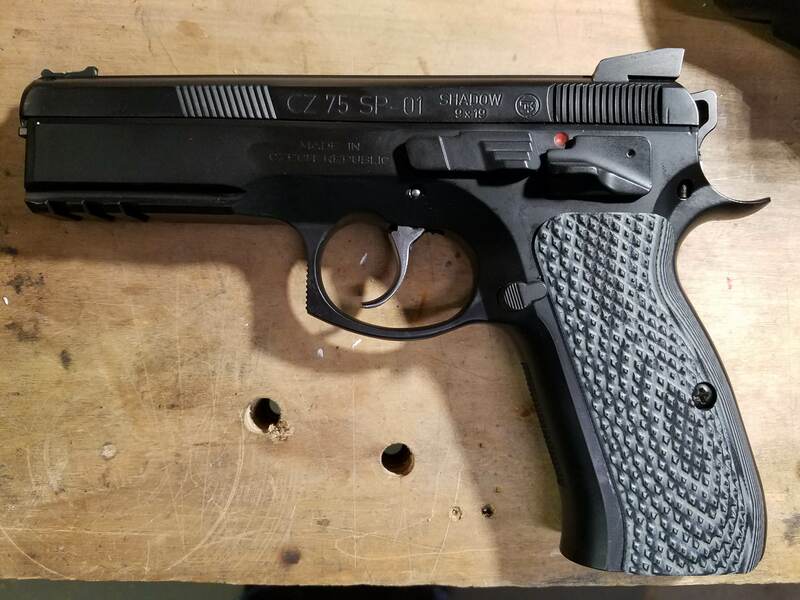 In mid-April, I cut a deal on a CZ Shadow SP-01 from a fellow Cross Timbers guy. He had already installed all the Pro Package parts that Cajun Gunworks offers and included all the original parts, a CompTac holster and mag pouches and a stack of magazines. It was simply too nice to pass up. 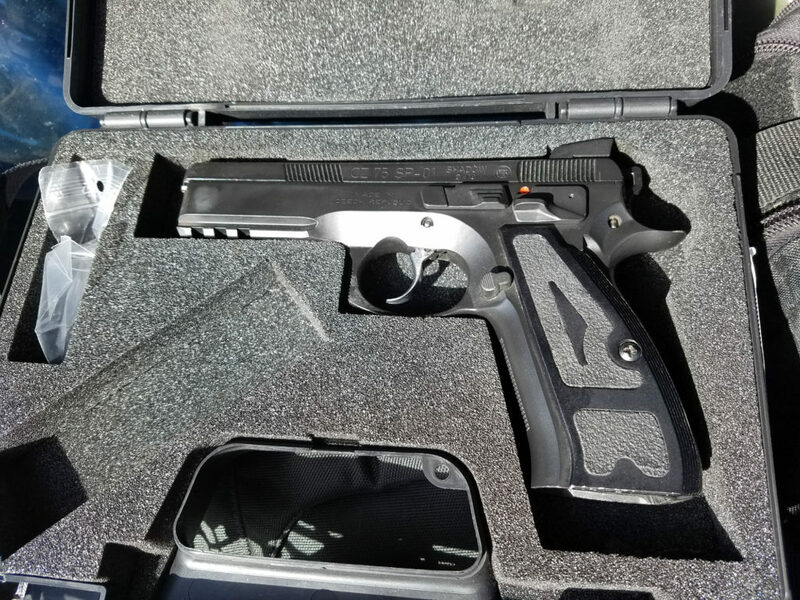 Although I had that nice new (to me) CZ with an incredible trigger, I didn’t want to recalibrate my brain thing for another pistol so close to Texas State. I worked for the TX State Republic of Comp-Tac match. Hey, I like Comp-Tac products and as the sponsor, they can call it what they want. But Republic of Comp-Tac? On staff day, I shot reasonably well. I placed (without award) 4th in my division and class. While I did not win any shooting awards, I did win a pretty valuable drawing prize, a CED chronograph. Now, I have a chrono that I have been plenty happy with. I tried out the new one and found that it has some very nice features in the controller, such as calculating power factor, gobs of string memory, the ability to clock extremely slow projectiles. 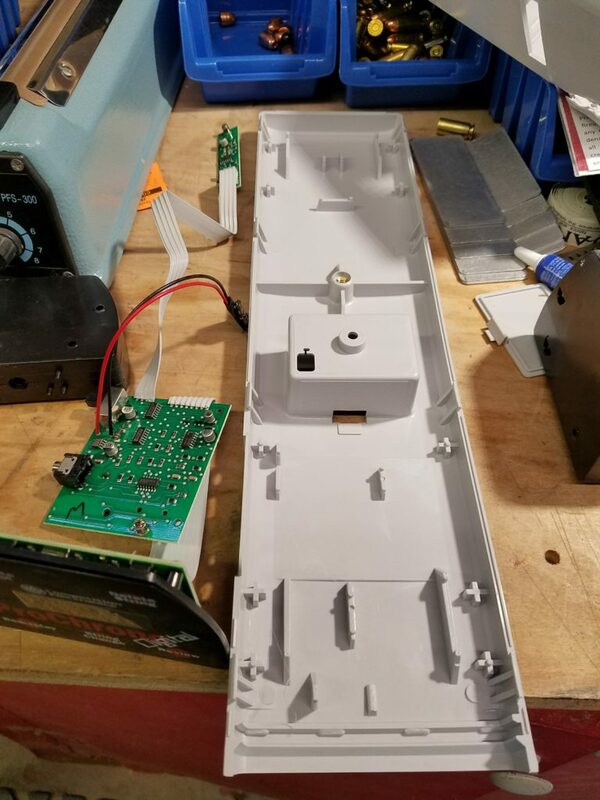 On the other hand, it is physically larger and substantially more complex to deploy, requiring the sensors to be clamped on to the mounting bracket and wires run to the controller. The unit generally and the screens specifically are much larger and catch more wind. Alternatively, my ProChrono is a one piece affair. Put it on the tripod, turn it on and go. If it is overcast, you don’t even have to use the screens. (actually, that’s true of most chronographs). The TX State match was the last in which I used my Glock, preferring at this point the CZ. The CZ is treating me fairly well, too. The only thing I have done to it is change the grips. The ones on it looked great and they were large enough for my hands, but a little slick. I put on some VZ G10 grips with some very aggressive texture. This whole thing is a pretty big swing in standard procedures, not the least of which is that I am now loading mostly 9mm instead of 40 S&W. I have coordinated with fellow CZ shooters to load ballistically similar ammo so that we can serve as backup for one another, floating all boats kinda stuff. 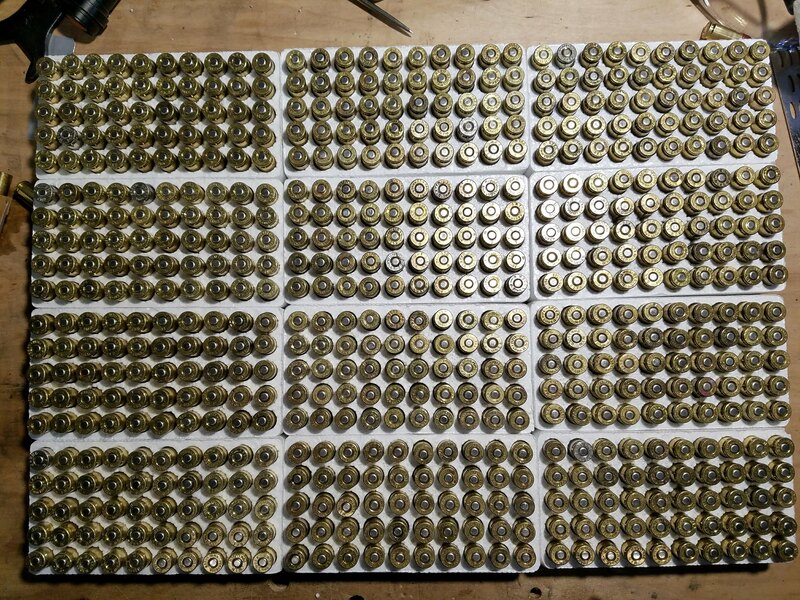 I am loading 135g Cimarron bullets running just under 1000 FPS. 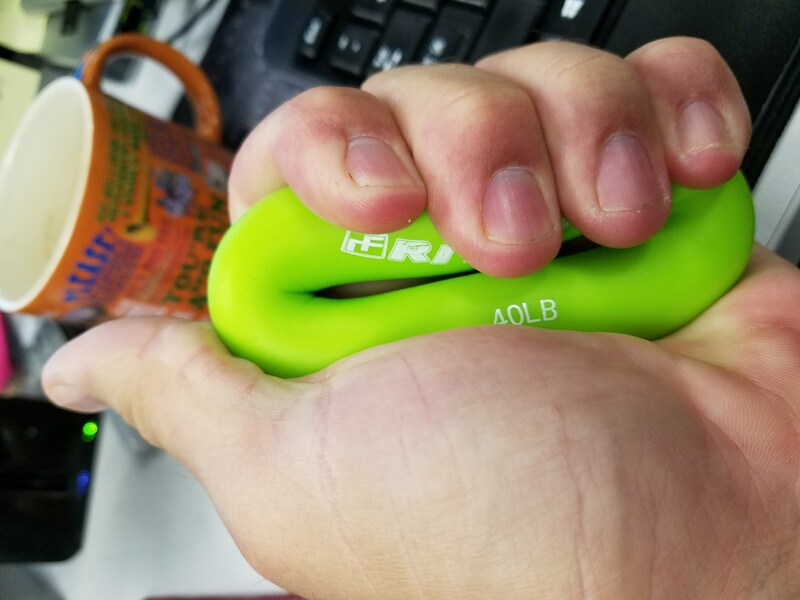 I have been working out my hands, particularly the left, to produce a more solid grip. I got a set of simple rubber exercisers, ranging from 30 to 80 pounds. I keep one on my desk at work, one in my car and a couple at home. The one in the car gets the most use, as my drive to and from work is about an hour each way. I spent the rest of staff day taping, occasionally running the scorepad and deflecting apologies when someone would ask me how I had shot any particular stage 🙂 For match day, I was the full time scorekeeper on our stage. In what was sort of an impulse purchase, I picked up a MantisX training device. Basically, its a Bluetooth equipped accelerometer that mounts on a Picatinny rail. I say impulse purchase because I had been interested for some time and while perusing the match book for the Gulf Coast Championship, I saw that they were a sponsor and I decided to pull the trigger, so to speak. It is an interesting device. You mount it, start the app on your phone (which requires setting up an account with them) and connect to it via Bluetooth. It “listens” for a hammer fall and reports on how much your point of aim wanders for 200 milliseconds or so either side of the hammer. 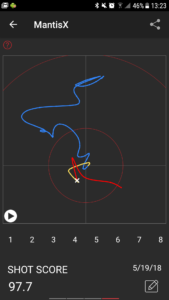 The blue trace is aiming time, yellow is during your (estimated) trigger pull time and red is after the hammer falls. As you can see, it is very sensitive to movement. 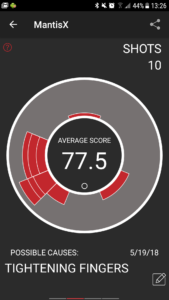 That trace looks like I was waving the pistol around like a madman, but the exercise scored a 97.7 out of 100. It has several training exercises for you to work through. One of them includes an analysis of possible causes for the biggest issue during that particular exercise. My biggest complaint is that with the 400 or so millisecond window on either side of the hammer fall, it is not suited to analyzing movement for rapid followup shots or split timing or any of those sorts of competitive data. Even so, I think it has helped me, particularly pulling through a double action trigger. Speaking of Gulf Coast Championship, it was hot, especially on Friday. A few of us who were squading together went to see the stages Friday afternoon. The actual temperature wasn’t so terrible, numerically, but it was death by drowning to breathe the floating liquid that passes for air down there. Match day was a little better due to mostly cloudy conditions that kept the sun at bay. They were challenging stages and a lot of fun. I was 9th in my division and class, which perhaps obviously got no award, but 7th, 8th and 9th were within a 4 second window. Leaving the site at the end of the day, I didn’t notice that the powered gate had begun to close and I managed to get a little scrape from it. It definitely could have been worse! It mostly buffed out. I have wanted a night vision scope of some kind for quite a while. I found an ATN X-Sight II for a decent price. 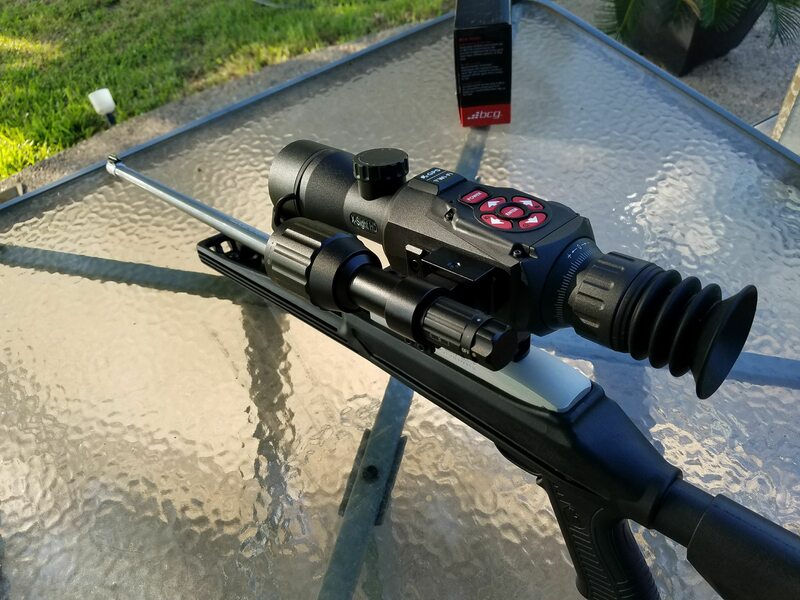 Long term, I think I will put it on my pellet rifle as a tool to address small nocturnal varmints, but for learning about it, I put it on my Ruger 10/22. I sighted it in in daylight conditions, mostly to learn about the copious menus it has. A couple of the cooler features are that you can store various profiles that make it easier to move it between weapons, but also so you can store multiple profiles for each weapon. You might have a profile for one rifle sighted in at 25 yards and the same rifle sighted in at 100 yards. Just pick the profile from the menu and aim accordingly. It also has some rangefinding capabilities, based on stored height information about certain targets. For example, it includes a profile for a deer that assumes 5.9 feet from hooves to tips of antlers. 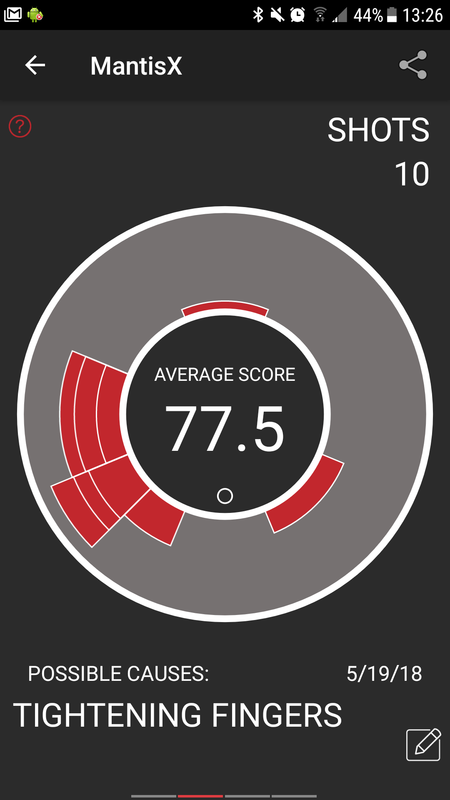 In rangefinding mode (which is not a particularly quick process), it tells you to hold a line and the bottom of the target then at the top of the target. 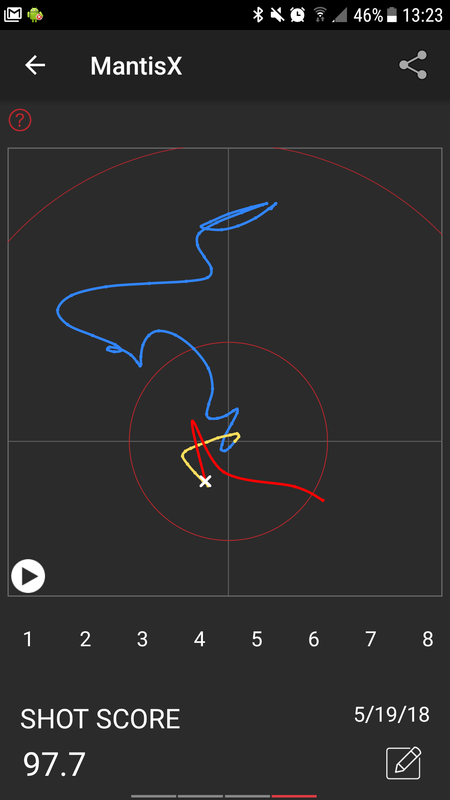 It calculates the range based on the tilt difference between the two. I’m looking forward to trying it out in real conditions sometime. These days, I generally load Cimmaron bullets in 9mm, but I am not exclusive to one brand. Before Cimmaron, I’ve had great results with Xtreme Bullets. 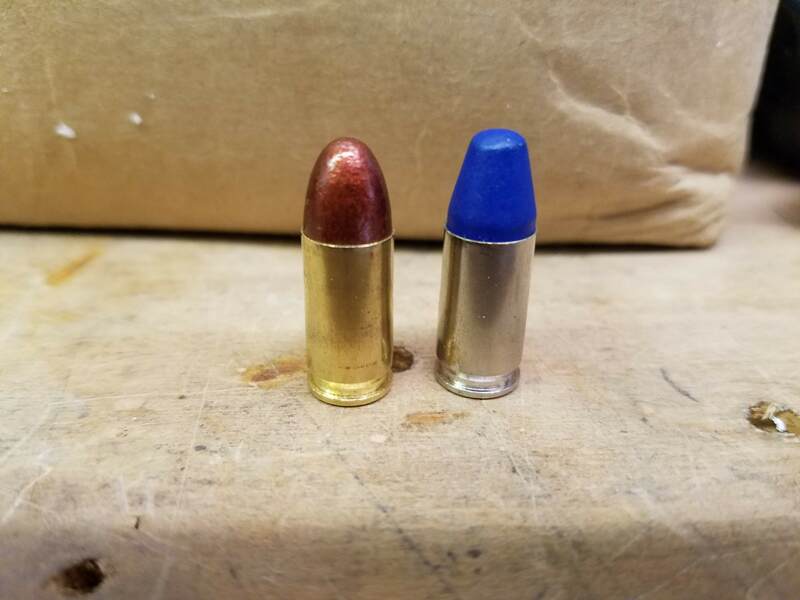 One of my friends prefers to load only Xtreme bullets, so when he won a gift certificate for $50 worth of Blue Bullets, we worked a trade and I ordered 1000 135g Blue Bullets in 9mm. Like most bullets, they look really good in nickel cases. We had a fun outdoor two gun match at the end of June. 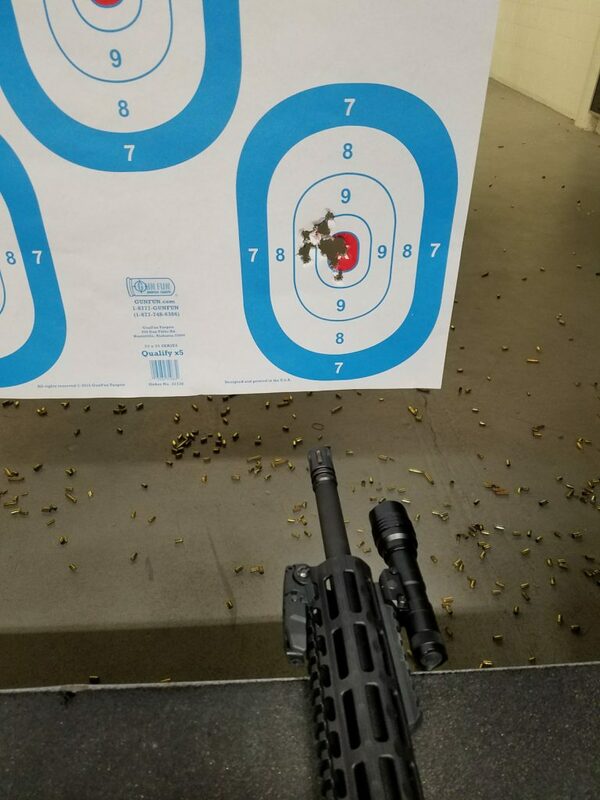 I shot the AR and loaned my PCC to friends. We had a great time! One stage had a revolver pick-up gun that had to be loaded on the clock. It also unfortunately spent most of it’s time in the sun, so it was literally hot as a pistol. Our July 4th match was not canceled. For two of the stages, we had a full auto MP5 for a pickup gun :). For the first stage, there were three targets in the middle that you were exposed to immediately, one at a shooting position to the left and two at a shooting position to the right. We had a full 25 round magazine and several options for engaging with it. 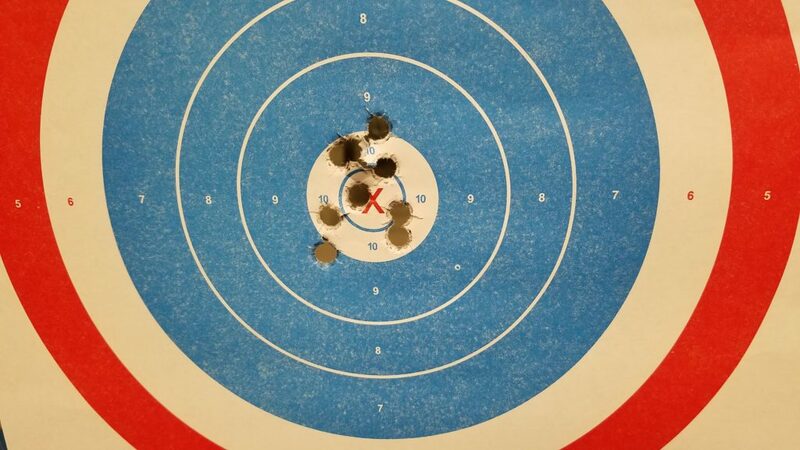 The first three targets required 5 each. The more competitive ones chose to go single action for most of the targets until the mag ran out, then the rest with their pistol. The more adventurous used careful trigger control to fire controlled bursts in basically the same way. Most people did not really blast away with the MP5, which was unfortunate. 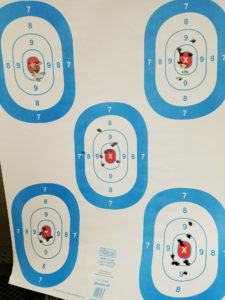 I chose a hybrid approach, 15 single shots on the first three targets, switch from single to full, dump the rest of the 10 rounds on the left target, then use my pistol for the rest. I was pleased with my grouping for the 10 rounds, with 6 in the zero zone. It was actually better than the single shots in the middle targets. 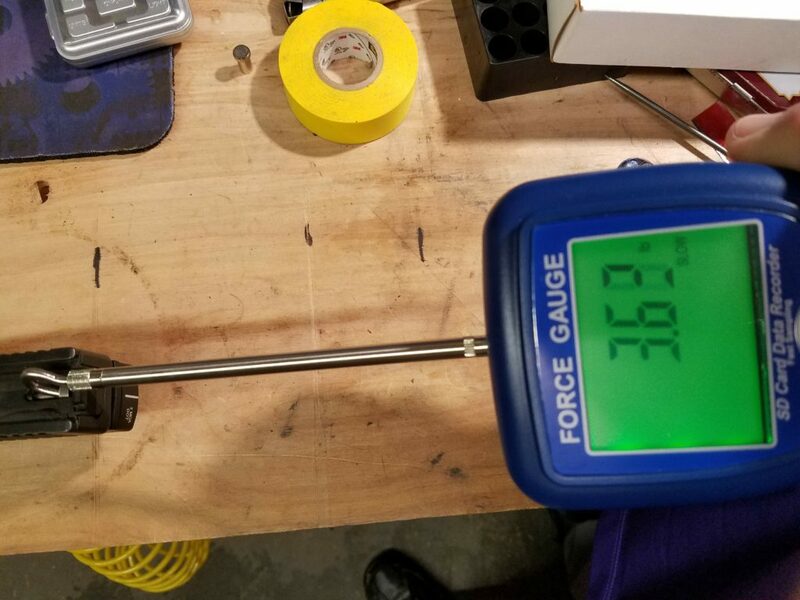 Finally, I have wanted to build an adapter for my force gauge to allow me to measure trigger pull. It turned out to be reasonably easy. I found a heavy wire hook, kind of a pegboard type of thing, but not quite. The part I needed was a nice square 90 degree bend on one end and I cut other end off. I threaded the long end with 5mm x 0.8 pitch and secured a coupling nut with LocTite. 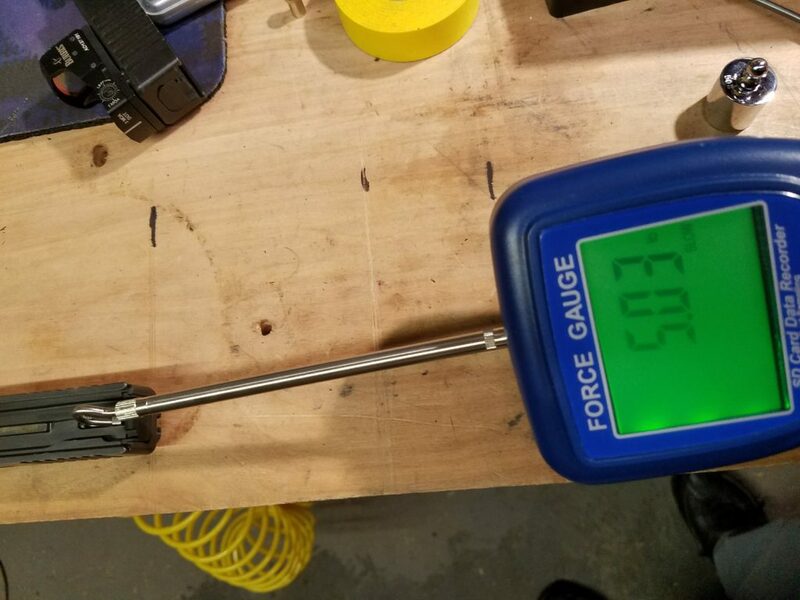 The hardest part was fitting it to the force gauge. I wanted the hook pointing level and to the left, making it easier to operate, at least for a right handed operator. It works really well. To use, hold it level, zero the meter, hook the trigger, then slowly pull. I found putting the meter in peak mode make it much easier to catch the actual reading. The CZ in double action and single action. First, it has been a very busy month! I mentioned last time that the trigger safety on my primary IDPA pistol had gone on walkabout. This was discovered before a regular Wednesday night match and later research reveals that I had not noticed it was missing for at least a week and probably two. 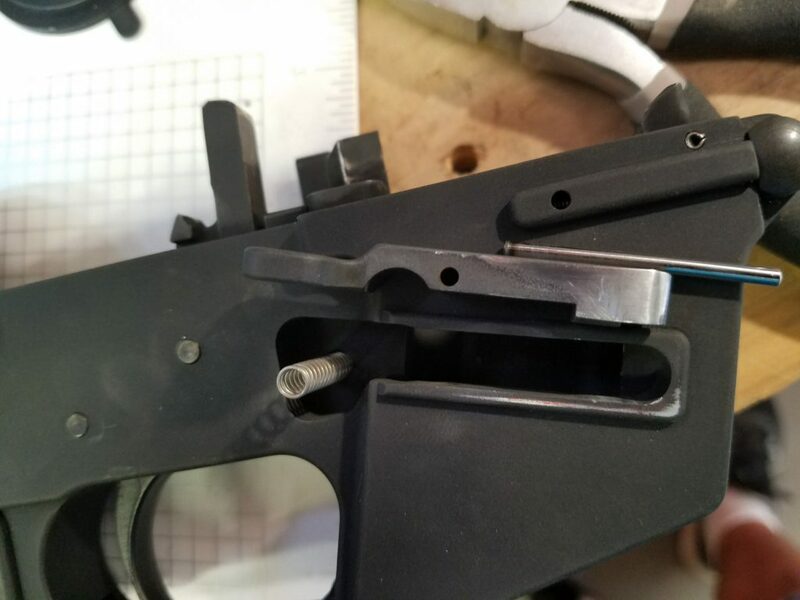 Well, I made little of the missing part, completed the match, split the collected brass with another loader and went on with life, including ordering a replacement trigger, which Zev thankfully covered under warranty exchange. A couple of days later, I was cleaning that brass and I was kinda vaguely on the lookout for the safety and extremely to my surprise, it was in that brass! That means it was lost there at or before the lunchtime range trip in which I snapped a pic of the pistol, survived who know how many times sweeping the floor, including a couple of IDPA matches, only to end up the the *half* of the brass swept up on *the night* I discovered it was missing. Sadly, the lottery tickets I bought when I realized the pretty low probabilities of all that happening did not pan out as well. Even before the trigger fiasco, I had decided that I would attempt to shoot CDP division for while, which basically means either 1911 and barney mag or the Glock 21. I went for the Glock angle. My Glock 21 had Warren Tactical Sevigny sights on it, which are very nice but that I personally don’t care for. I am kinda spoiled to dots on the rear sight and I had some delay in finding a sight picture quickly. I picked up a set of TruGlo TFX Pro sights and swapped them out. Now that they are in place, I kind of wish I’d put the TFX Pro sights on the G20 and put the older TFO sights on the G21. I may still. I went to what is officially the most distant IDPA match that I have gone to *for the match*. I did manage to take in a local match in Phoenix last summer while I was there for work and that was farther away, but this was a level 3 IDPA Regional Match to benefit the American Foundation for Suicide Prevention. The event raised $7000 for the AFSP. When the dust first settled, I was 7th in my class and division. While we waited for the scores to be finalized, it turned out that one squad’s scores for Stage 8 had dissolved into digital dust somewhere. At first, they had requested that squad return to that stage for a reshoot, but it turned out that some of those guys had left for the day. They decided to throw that stage out, which did result in a little bit of cheering. Apparently it was not a great stage for many shooters. My own time jumped up quite a bit. It was my worst stage as well, though other people must had done especially poorly on it. When the dust settled for real this time, I had a better score but had gone down to 9th. Obviously, at least a couple of ESP Sharpshooters had shot generally better than I did, but must have really stunk up Stage 8. 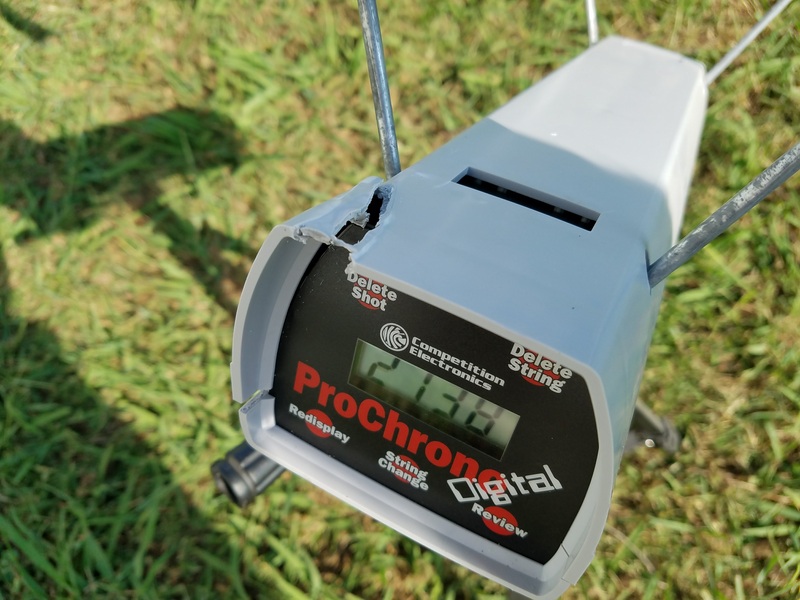 For the matches leading up to the Arkansas trip and for that match, I had worked up a nice load running 130PF at home, just to be sure I had a little margin for the chrono in Arkasas. 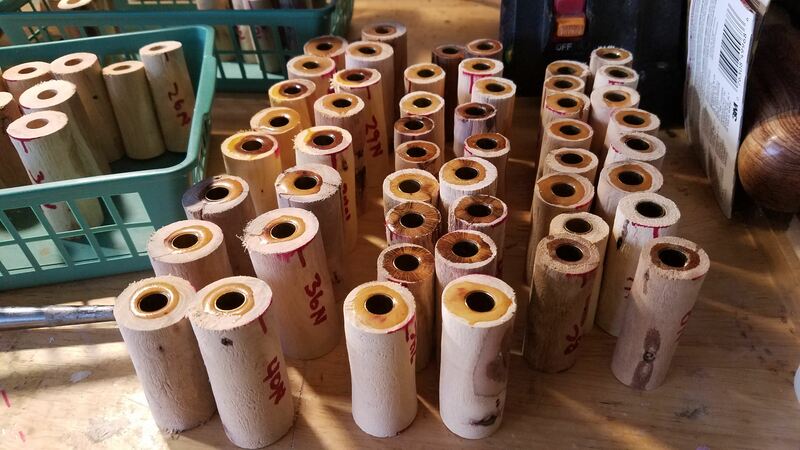 I loaded 300 rounds into boxes that were marked specifically for that match and eight more for the several matches before going to Arkansas. All of this ammo is ideally the same. For the first match after I got back from Arkansas, I had some intermittent failures to feed. In a couple of those stages, it was just about like I had a bolt action Glock, having to bump the slide or rack out what felt like after every round fired. It was painful! Between stages, I cleaned the barrel. 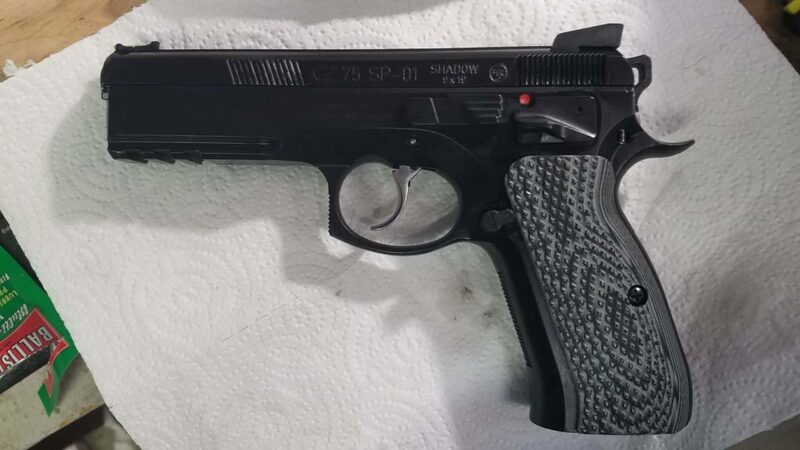 The pistol had not been cleaned since the MVSA match and while I had never had that much trouble with it being just a little dirty, it seemed to help some. Then I noticed that it might be one particular magazine. It’s just hard to troubleshoot during a match. It occurs to me that some of these magazines are approaching more than 10 years old and still others came to me from elsewhere, so no telling how old they are. I decided to do a full clean and recondition of all of them, complete with replacement springs. A 10 pack of Wolff +10% magazine springs is less than $50 and less than the individual cost of ordering 7 springs. They should be in soon. I mentioned in a previous post a while back that I acquired a Reed SD-6020 force gauge. It is a fun and interesting tool. 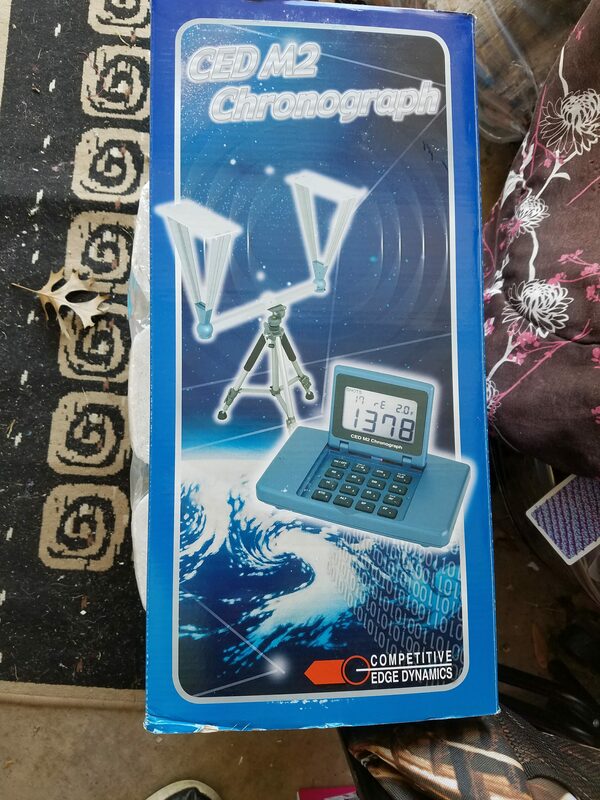 I have used it mostly for measuring springs thus far. 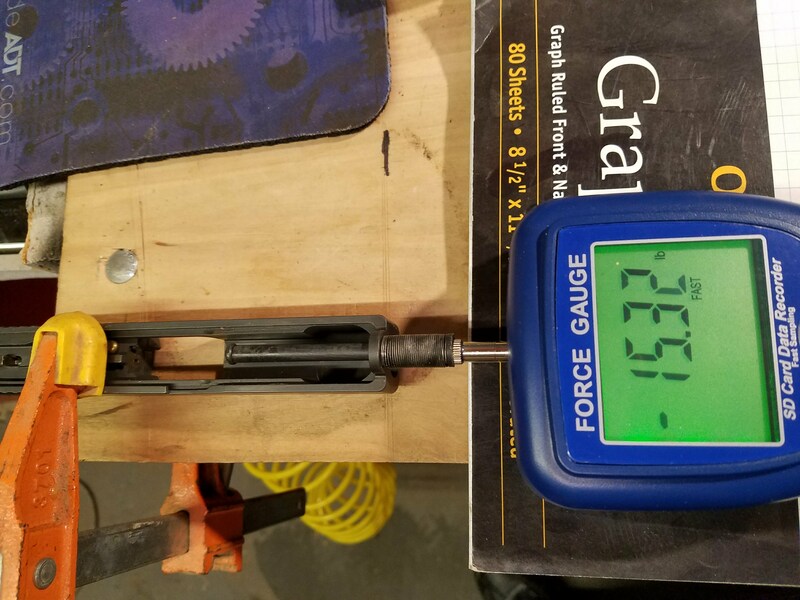 I have a workable technique for measuring captive recoil springs a la Glock. 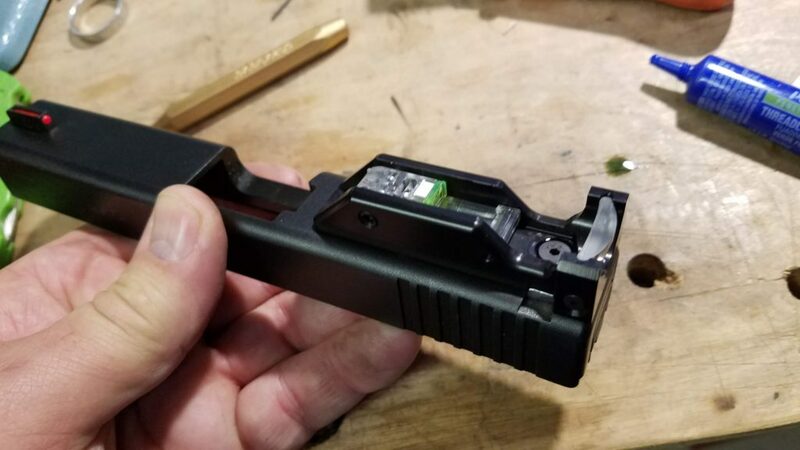 I clamp a Glock slide my workbench then put a spacer under the force gauge such that the sensor is reasonably level with the hole in the slide. In this case, a tablet of graph paper I have is the right size. Then I can slide the gauge back and forth compressing the spring and read the weight. Here a stock Glock spring, with its plastic guide rod, rings out at 15.32 pounds. To take this measurement, I compress the spring until it locks solid, then back off a hair. Yes, a hair, enough to tell that the spring is no longer compressed completely, a small fraction of a millimeter. This seems to be the valid place to measure because it corresponds with the maximum 2 inches of travel that the slide does when installed on the pistol. I have several aftermarket springs with stainless steel guide rods. At first, I bought stock weight springs. 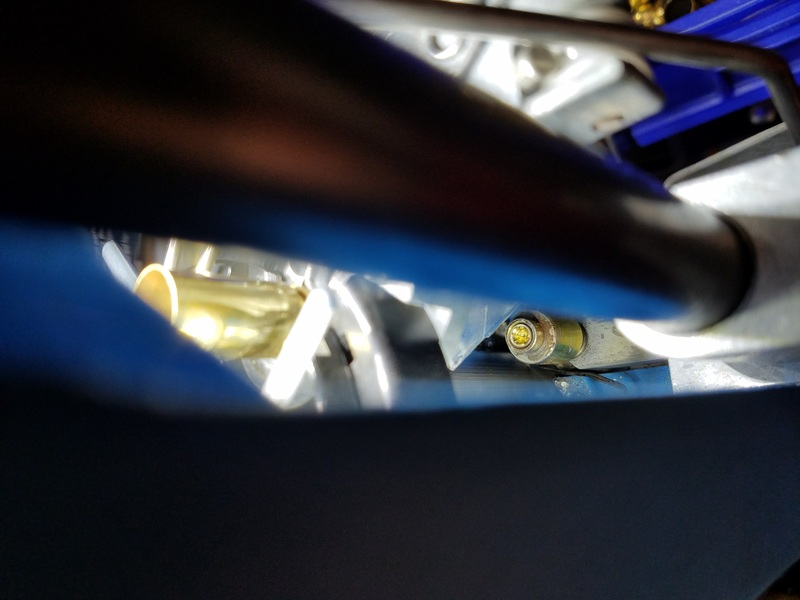 Then I started handloading specifically to soft recoil and found I needed lighter springs to tune the pistol to run the lighter loads. I remember ordering a 13 pound spring and I thought I had ordered an 11 pound spring. They are marked in paint colors out of the package, but the paint is long gone after using and cleaning the pistol many times. 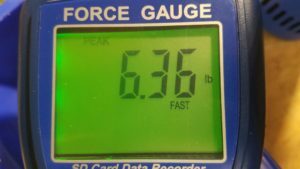 However, I could not find any springs that went below about 13.5 pounds or so. Soooo… I ordered a new 11 pound spring. Guess what? 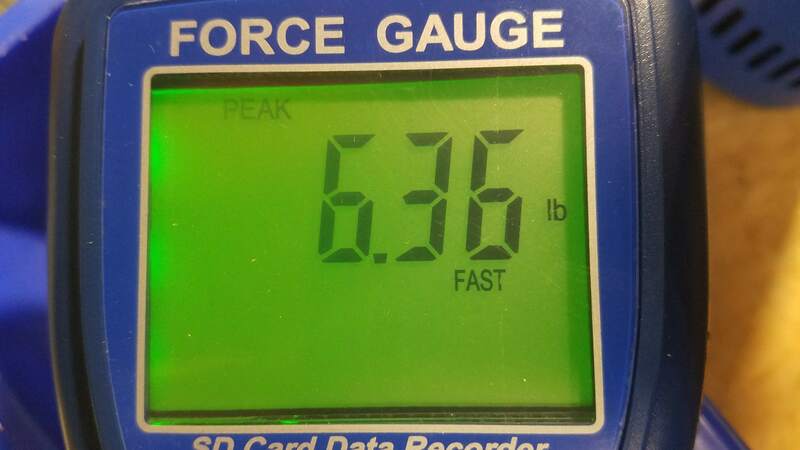 It measures at over 13 pounds. 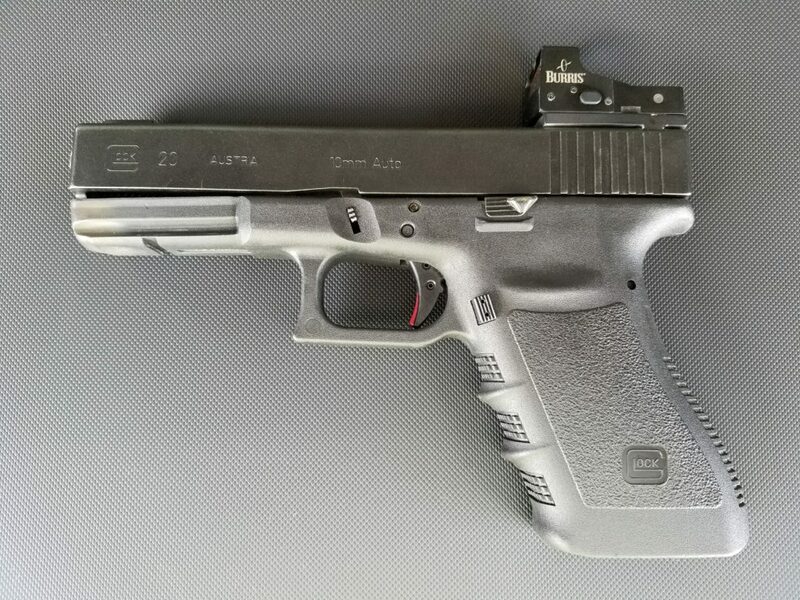 The Glock 20 slide with the nicest trigger pull is only 3.6 pounds. After I installed a Zev Fulcrum Ultimate trigger kit (trigger, springs, striker, etc) I knew that I started getting light primer strikes, especially with ammo I had loaded with S&B primers, so not at all surprised to find this. I had a few striker springs, presumed to be stock weight from previous upgrades, and Glockstore competition spring kit, so I swapped some springs around to get a 5 pound striker spring in the Carry Optic slide and 4 pounds in the regular slide, though I should probably swap those. The trigger pull predictably went up. Shrug. It remains to be seen if that solves the light strike issue on my S&B primers. They are sitting in storage at the moment because I never want to knowingly introduce an ammo problem if I can avoid it. Speaking of the Zev trigger, at a match last night I struck up a conversation about trigger work with a buddy at the safe table. In exchanging pistols in the discussion, I noticed that the trigger safety was missing from the pistol. We decided that it would be fine for the local match, but that it will definitely need to be fixed before any major match and really needs to be fixed regardless. It is a mystery exactly when and where it was lost. 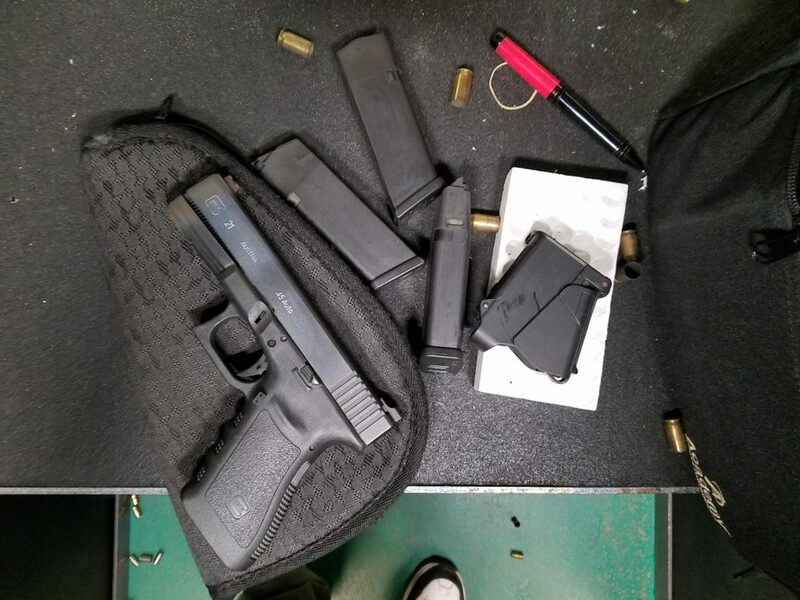 I have a picture of the pistol from a range trip a couple weeks ago and it appears to be missing even then. The only previous picture I have that shows the trigger was from last August and the safety was present then. Upon close examination, you can see that it appears to be held in by a set screw, which is missing. 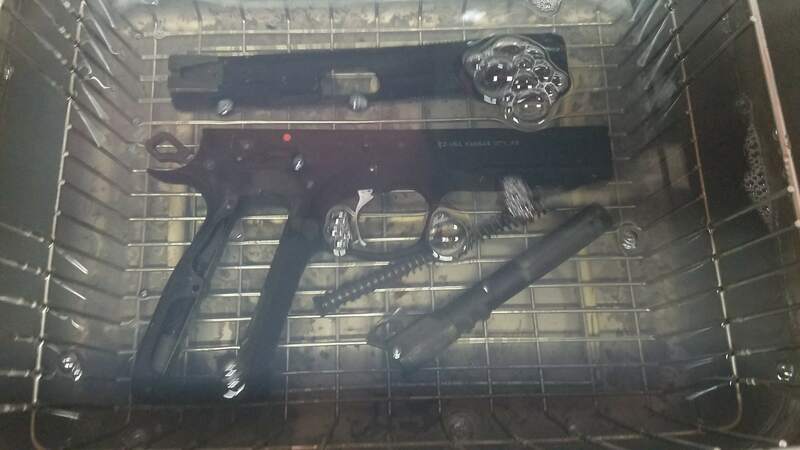 I have not adjusted any of the adjustments on the trigger, but I have used the ultrasonic cleaner on it. I wonder if that eroded enough red Locktite away to let the screw come loose? I will check in the cleaner tonight on the off chance that it came loose *in* the cleaner. I contacted Zev about getting the parts sent to me. For liability reasons, what with it being a safety part, they are unwilling to send me the parts. On the other hand, they will exchange the whole trigger and bar for a new one. They sent me an RMA and mine will be on it’s way to them tomorrow. They promise I’ll have the new one back 1-3 days after they receive mine. Luckily, I do have two interchangeable frames. Even though the Glock 21 frame has a stock trigger, it is as smoothly polished and lightly sprung as a stock trigger can be, so I will still be able to shoot. 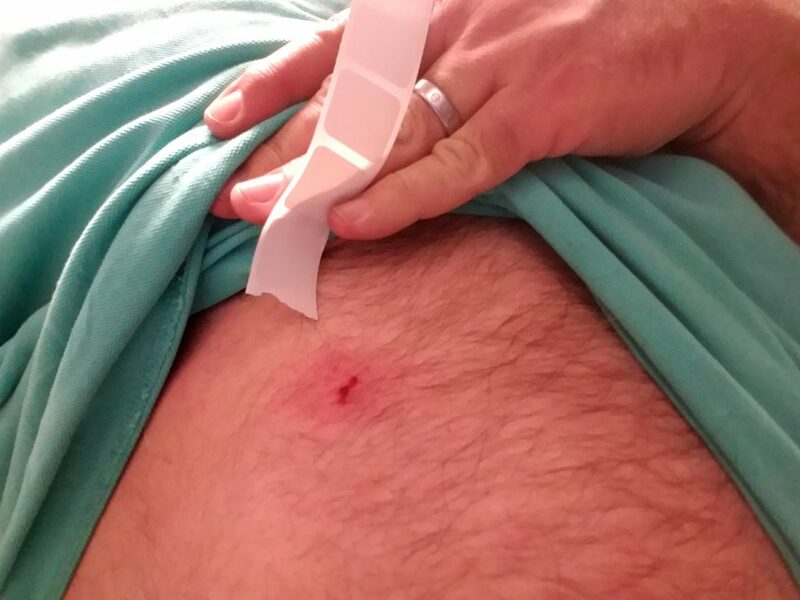 One of the things that happened in January is that I got shot. A bit of a bullet bounced back and dinged me pretty good. I lived, though it did sting a bit. I let myself run out of 180g 40/10 Cimarron bullets. I like them overall and they shoot really well, but they are a little fussier to load. 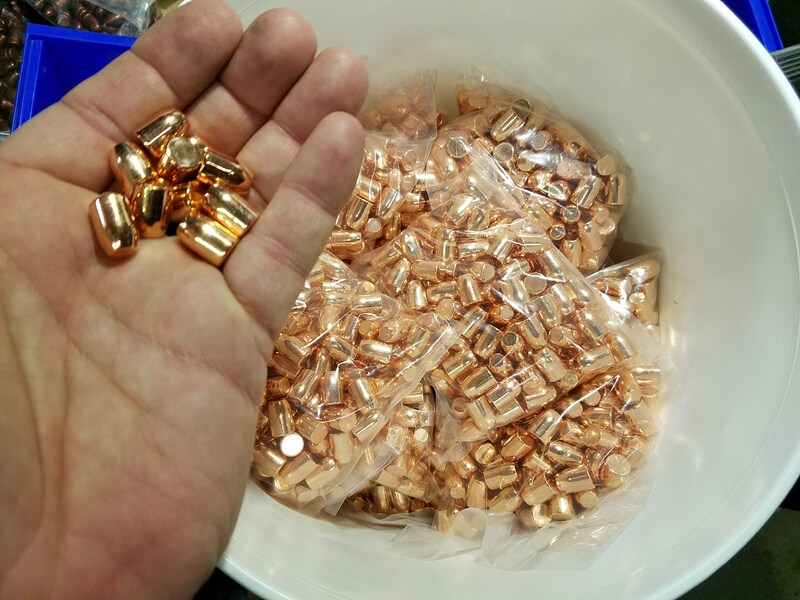 While waiting for a big order of Xtreme 180g bullets to arrive, I switched the press over to 9mm and loaded a bunch of 135g 9mm Cimarron bullets. I loaded 600 pretty much in one sitting. 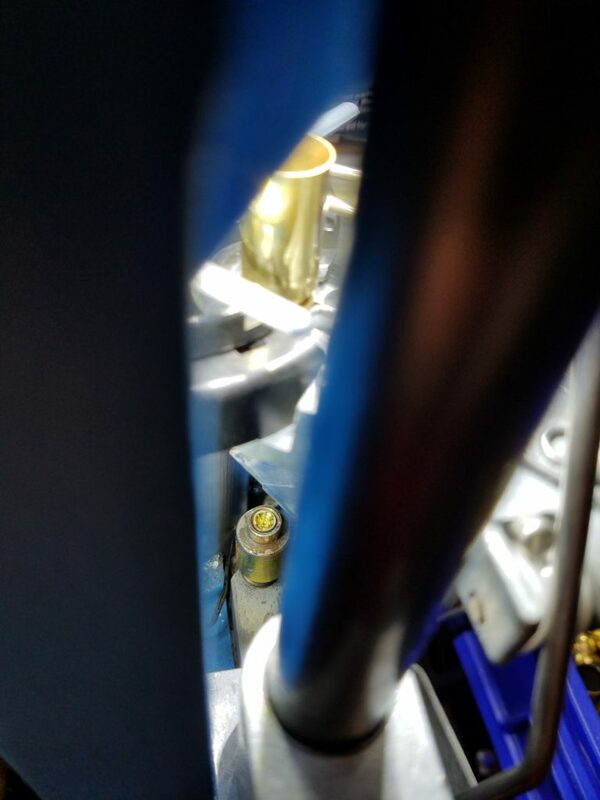 Right about this time, there was an interesting discussion on the Cross Timbers forum about sorting brass before loading and the reasons some people would do such a thing. There are basically two schools, those who want to make the most consistent ammo possible and those for whom the benefits are not commensurate to the required effort. I am in the middle somewhere, though closer to the latter. 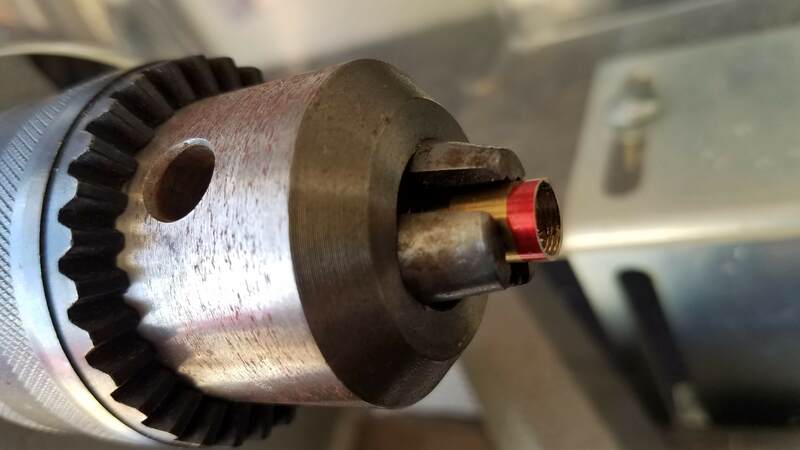 The discussion had a significant bent towards weeding out known troublesome brass, such as certain brands that have a stepped interior or crimped primers, before loading them. 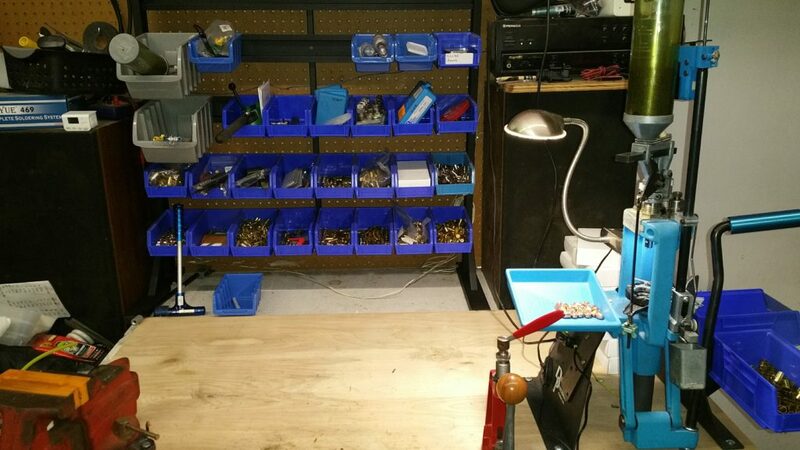 Since I had 600 rounds of ammo that had been loaded and passed all my QA processes, I counted and sorted them. Of course, it is a slightly skewed statistic for the purposes of the forum discussion because these 600 rounds were all *good*, with no failures. On the other hand, in 600 rounds of loading, I probably didn’t have more than a dozen or so that were culled during loading (mostly crimped primers or obviously damaged cases) and fewer than that made it through the press to fail QA. About 52% of the ammo was one of 4 headstamps and more than half of that was one or another form of Winchester. One of the most interesting statistics to me was that there were 26 of a specific WCC headstamp that were all originally crimped primers, but obviously all of them loaded without issue. I’m presuming that some of them may have been previously loaded on a press that swages primer pockets or maybe the crimp happened to be of a suitable symmetry to reload without issue. Until recently, I have ordered bullets in 500 and 1000 quantities only, mostly just to keep from spending a lot at once. The long term economics are a little better for the larger orders, at least in terms of shipping costs, especially when the seller runs a shipping special. 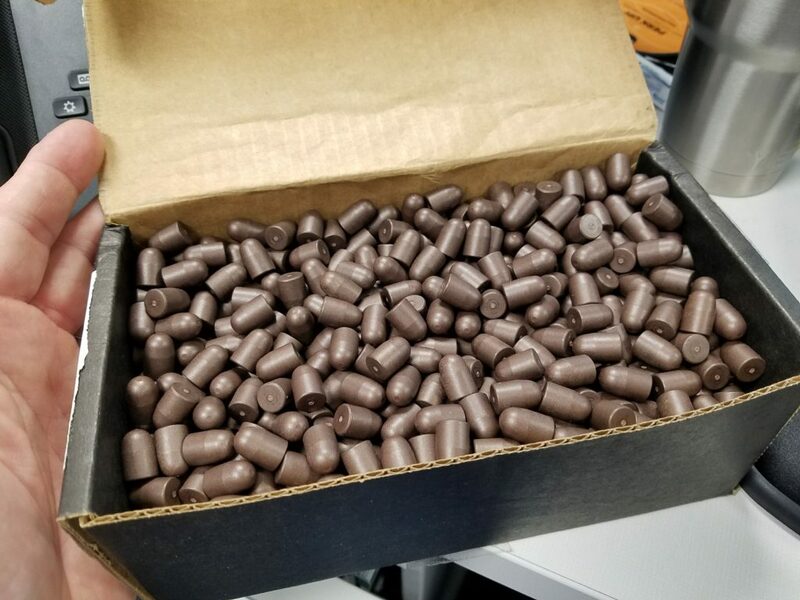 I noticed that, for X-Treme Bullets at least, the bulk quantities of each bullet weight seems to be driven to keep the package weight right about 65 pounds. I did some digging on UPS and FedEx websites and I could not find any magic price increase at or around 65 pounds. On the other hand, the price the website quoted for me to ship my 65 pound package was 7 times the flat rate $5 shipping for that order, so it may be part of a contract between X-Treme and UPS. In any case, a 65 pound bucket o’ bullets is pretty heavy. Way back in October, before my last update even, I picked up a VibraPrime, an interesting device intended to help one spend less time filling primer tubes. As described, “The Vibra-Prime can load 100 primers into a primer tube in a matter of seconds with its unique motorized agitation mechanism.” For *that step* of the process, actually stacking primers in a tube, it works as advertised. 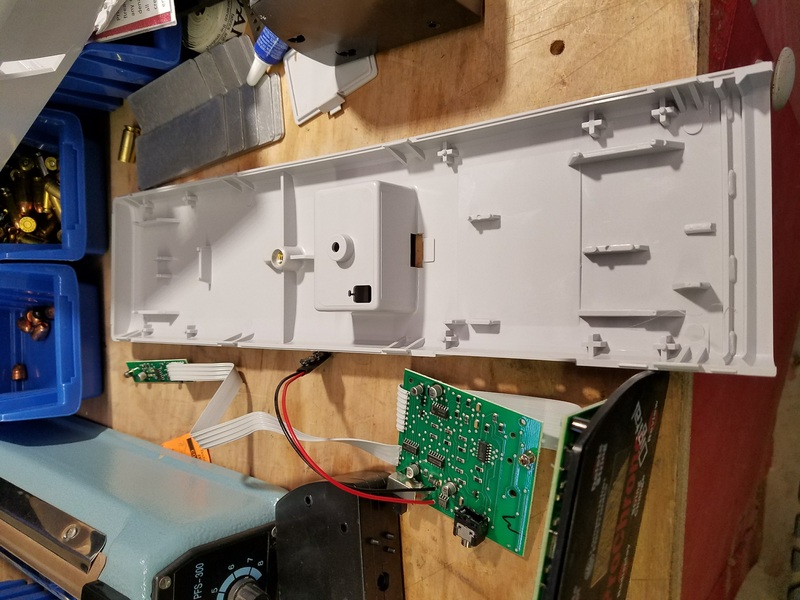 However, in my experience with it, the entire process from a box of primers to a tube ready to load into the press, the VibraPrime is a fussy process with too many steps. Use a standard primer flip tray to right the primers, place the cover over them, invert, remove the tray and pick up 100 individual primers directly into the pickup tube in about the same amount of time, maybe less. No batteries, no intermediary tools, more free brain cycles to use to think about the analytical algebraic topology of locally Euclidean metrization of an infinitely differentiable Riemannian manifold. Where I think it could help is scaling. If you have a dozen tubes to fill, you could probably do them faster than by manual means. For me, however, I don’t think I gain much from the machine. I already had some nice bright LED lighting on my press. 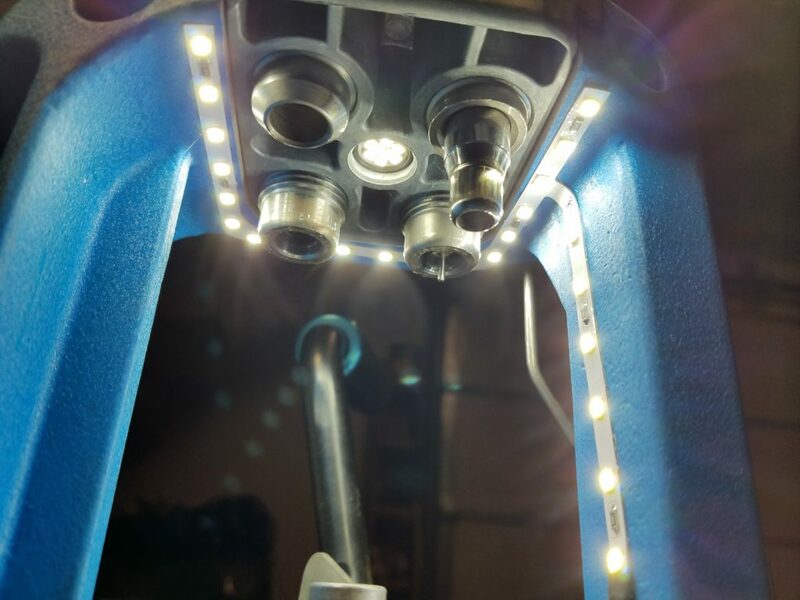 The Inline Fabriction light mounts in the center hole of the tool head, shining directly down on the shell plate. This was a tremendous improvement over my clamp light, which provides a lot of light itself. Now I have added the UFO 550 from KMS. From this angle, it looks like I’m about to be vaporized in the evil scientist’s invention. Note that the Inline Fabrication light is still there. More light is always better. The UFO light, besides just throwing more lumens, also has a bit that goes down the front of the frame, on the right side in the pic above. This lights up the primer slide, which is normally in the shadow of the shell plate. In mid-October came the Lone Star IDPA Championship, which was my first staff experience in a major match. In spite of being pretty much fully into the throws of seasonal allergy trigger asthma, I had a lot of fun and learned a lot about what it takes to put on a big match. I knew there was a lot to it, but some of the specific details were enlightening. I really enjoyed getting to see almost every single competitor shoot, other than the staff members that were on other squads on staff day. As for my match performance, I have definitely done worse, 95th overall (which doesn’t really mean anything), 14th in my class and division and somewhere in the mid-20’s & 30’s for any given stage. I had 11 down on one stage, single digits on all others and no procedural errors at all. 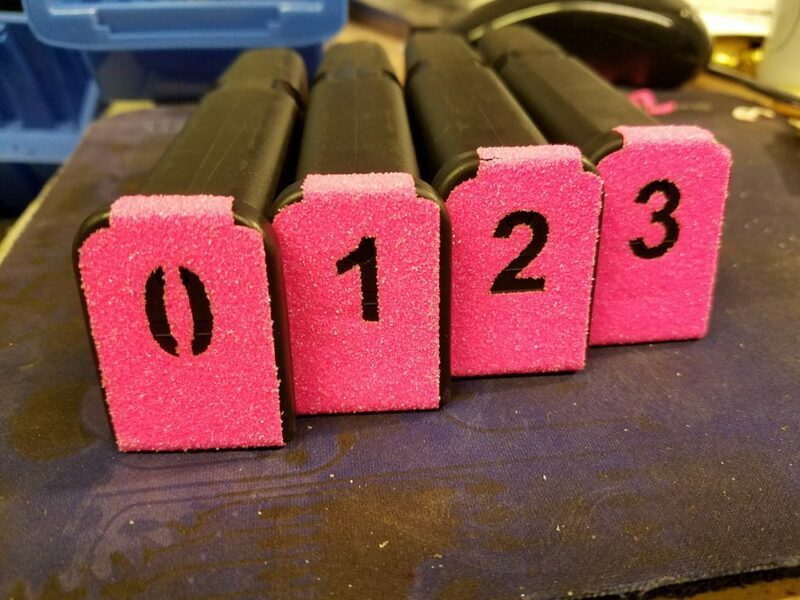 Nothing much for me on the prize table, just some hot pink magazine basepad markers that I put on the the G19 mags. October also marked the last match held at the financially troubled Total Shooting Sports. It was a nice venue and the Monday night matches we had there are missed and have not yet been replaced. When I got my FX9, did a quick and dirty sight-in and actually shot a couple of indoor carbine matches with it, but it was not really on at all. Miss enough heads or hit a few non-threats and you’ll want to spend the little while it takes to sight it in. I eventually got a handle on it. Author adminPosted on February 28, 2018 Categories Praise The LoadLeave a comment on Happy New Year! It took me a while to notice it, but the magazine release on the FX9 was a little sticky. The lever pivots on a pin that I was unable grab and pull. Eventually, however, repeated operation of the lever worked them pin out enough to pull. 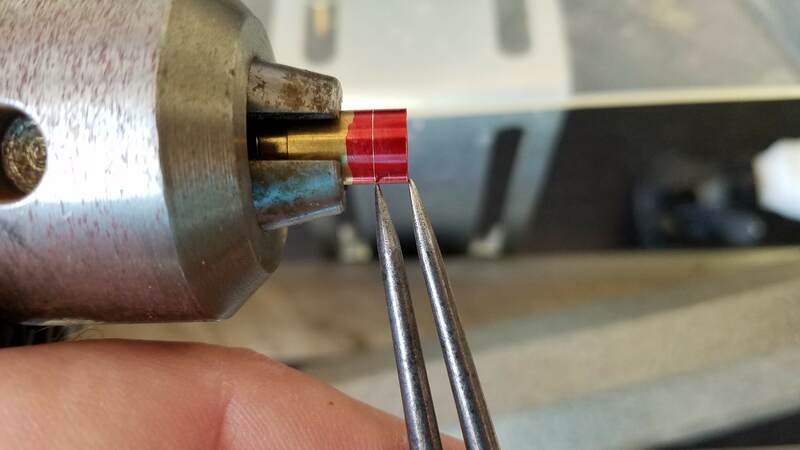 The red area is Sharpy stand-in for Dye-Chem I applied while the lever was still installed. The sticky bit was still unreachable inside the lower before the pin was removed. 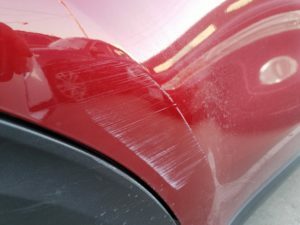 Once it was out, it was a simple matter to remove enough material to stop the scrape. All reassembled and reliable, with any of the magazines I have, regardless of brand. Woohoo! A lot has happened in the nearly 4 months since my last post. 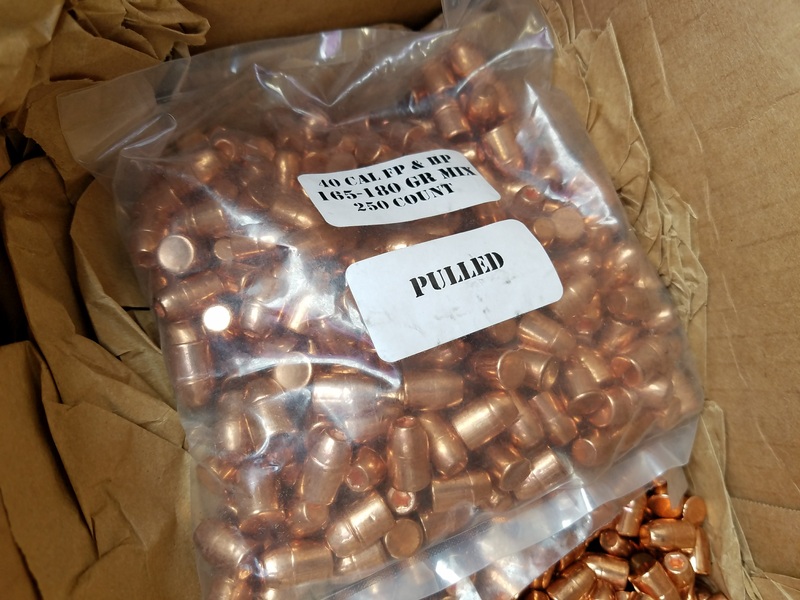 Polycase is now selling their lead free projectiles for handloading. Sadly, they are not particularly cheap, 18 to 22 cents apiece for 97 grain 40/10. The minute (literally) that I read the notice from MidwayUSA that they were selling them, I ordered 1000 for $188. That was with an introductory discount. They are $207/1000 as I write this. Interestingly, the bullet weight had less influence than expected on velocity. 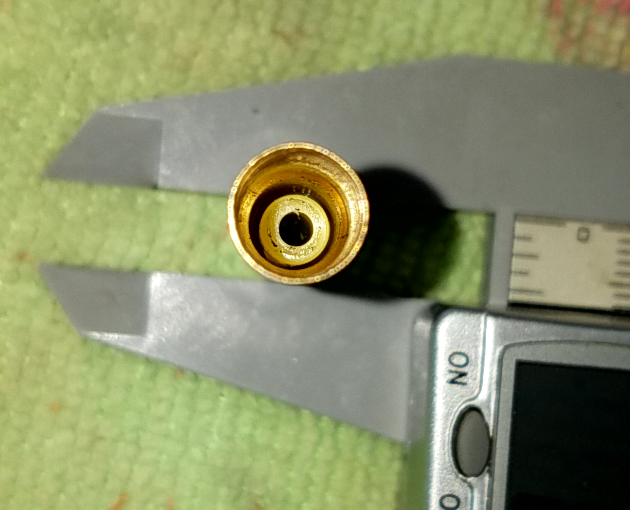 I started with the default 4.25g to 4.35g charge that I use for 180g bullets. The 180s run about 790fps for 144PF. However, that same charge under the 97 grain lead free was not very much faster, just over 800fps. To make 128PF, they need to be pushed to about 1300fps, thus the increase to 6.1g. They have served me well. They make clean holes in paper, knock down steel reliably and generate conversation occasionally. I don’t have many of that first order left and while I probably wont shoot it all the time due to cost, I also understand that the price will never come down if nobody buys them. I picked up a Freedom Ordnance FX-9 9mm carbine in a group purchase. The quantity discount was such that rifle, shipping and FFL fees were still less than the listed price for just one. It appears to be generally well made. Some of the other people in the club have upgraded and accessorized way more than I have. I added a Vortex StrikeFire 2 and MagPul MBUS and later an M-Lok rail and a flashlight for the first ever CTASA low light carbine match. The only trouble I have had with it was that it doesn’t seem to like fully loaded 30 round magazines. 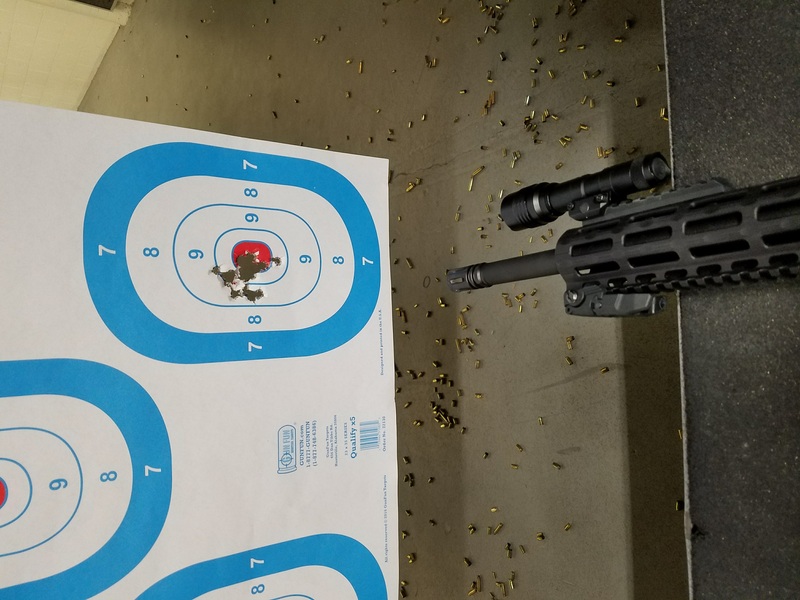 My first trip to the range with it, I had two issues with the supplied SGM magazine. 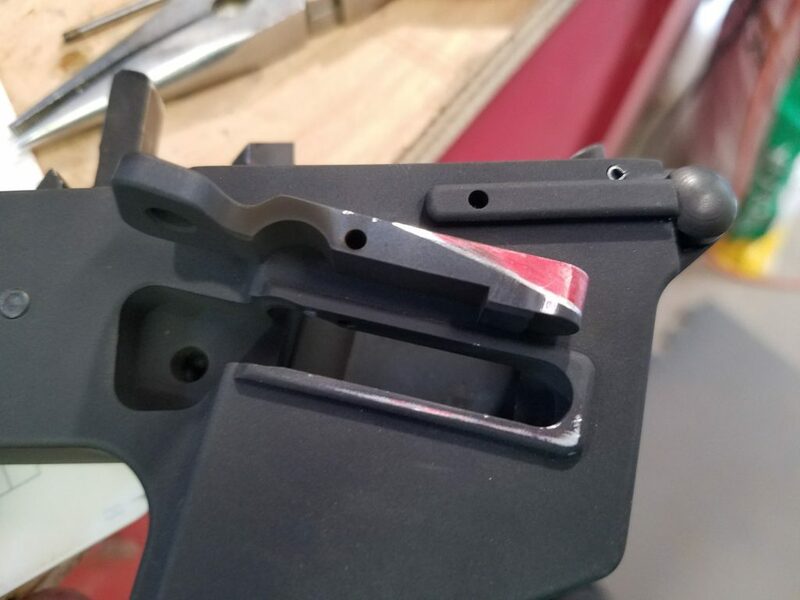 The first issue was that after a couple of rounds were fired, the floor plate came loose, dropping 20-something rounds and magazine parts all of the floor, resulting in an RO stop of the range to retrieve the parts. The tube remained in the gun, but all the internals fell. Later in the same range trip, the magazine fell out two or three rounds into a full one. I declared the magazine to be junk and just used the collection of magazines for my Glock 19. They seem to have worked fine. In one match, I loaned it to someone and it dropped a mag on them, but we blamed it on a lack of familiarity with the platform. Recently, however, I have discovered that the magazine release button/lever is a little bit sticky. The self-disassembling first time use of the SGM magazine would not have been caused by that, but other times when the magazine has fallen out could be that release button. I will address that for sure. Ammo-wise, it runs on almost everything I’ve put in it. All the factory ammo I have used, all 115g, and my 147g handloads for the G19 run perfectly. Some really soft 147g had a couple of FTEs per magazine, so that’s definitely too light. 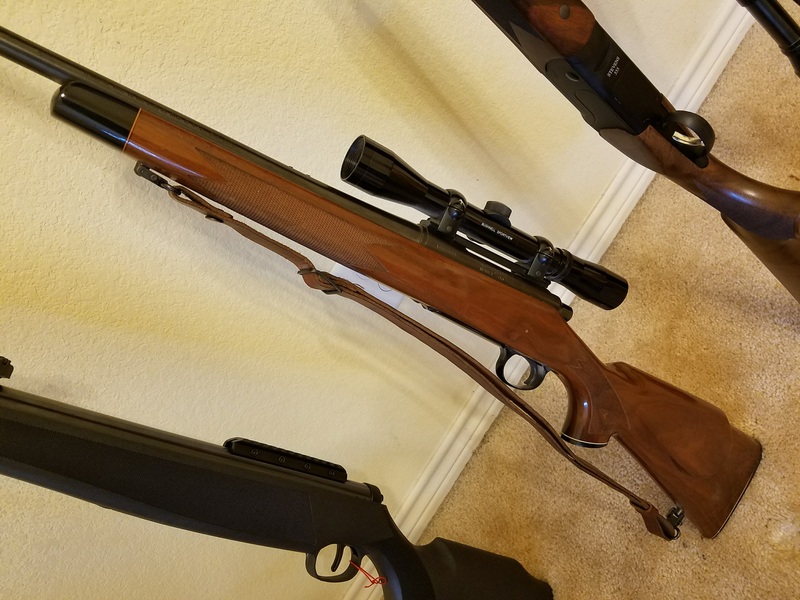 Some really soft 135g handloads ran reliably and recoil is similar to or maybe less than the 10/22. I have not chronographed those as yet, but since IDPA PCC requires a minimum of 135PF, I suspect they will come in too light. Speaking of chronograph, my poor chrono was shot twice within three weeks. First time, a buddy came out to work up and load a bunch of 45 Auto. One time, the pistol was pulled a bit to one side and the bullet caught one of the screen supports. 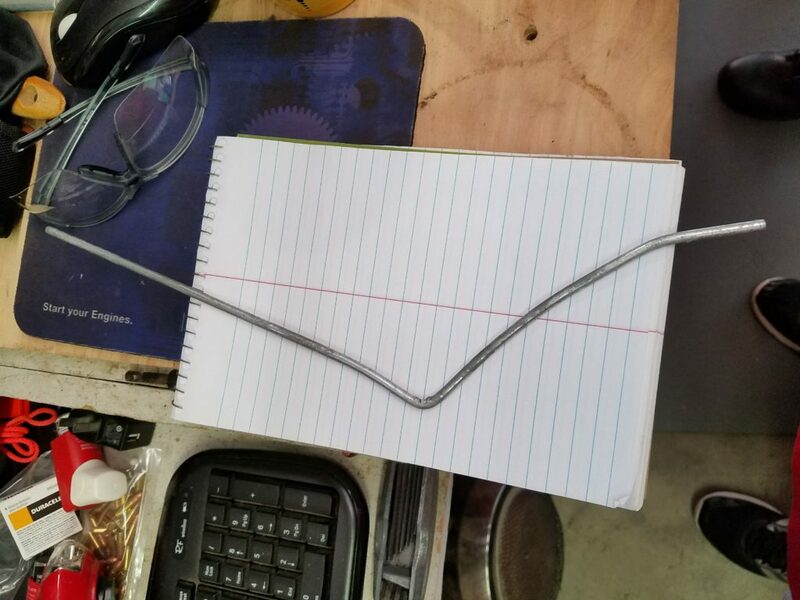 It only bent the wire; about one minute on the anvil and it’s good as new. Only last weekend, I had my turn. 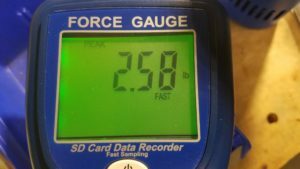 I tried out my usual competition load in the little Kahr CW40. The Kahr has a reeeeally long trigger pull and having immediately before shot the Zev in the G20, I pulled it down a bit, enough to hit the body of the appliance. Happily, it is only cosmetic damage and it works just fine. I found a heck of a deal on bullets. Xtreme Bullets has a discount house called Reloading Valley that sells, among other things, pulled bullets. I ordered 10 bags of 250 mixed 165/180 and mixxed RNFP/HP. They work out to about 6 cents apiece. Since they were mixed in both weight and type, I commenced to sorting them manually. 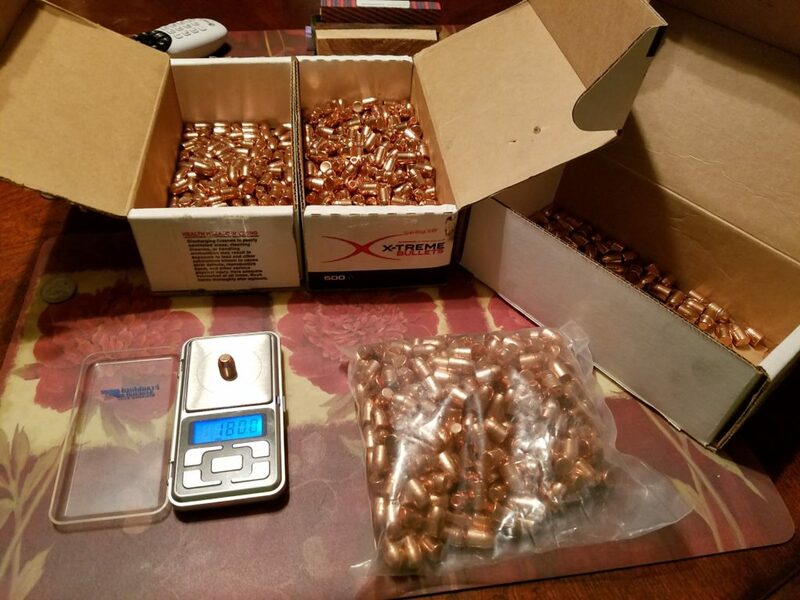 The distribution was essentially 99.9% 180g, maybe 20-30 165g bullets in 2500. Of those, about 1/3 were HP and 2/3 were RNFP. The pulling hardware damaged a few, mostly the HPs. 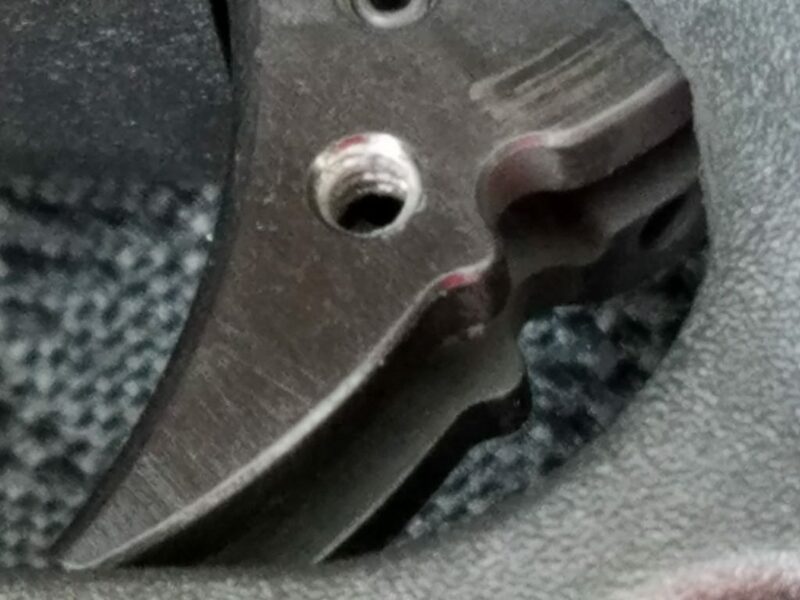 Most of the RNFP have only a faint mark from the case crimp. I have loaded about 500 thus far. There have been a couple that didn’t pass QA and at least a one that didn’t feed right. All in all, I’m pretty pleased with them. Along with PCC, IDPA now has a provisional Carry Optic division. As luck would have it, I already had a suitable optic and just had to reinstall it on the slide it was on when I got it. Author adminPosted on September 21, 2017 May 15, 2018 Categories Praise The LoadLeave a comment on Far Too Long!